Before we get started...all photos in this post were taken by Carissa of Ella Grace Photography. Please do not copy or alter these photos in any way. 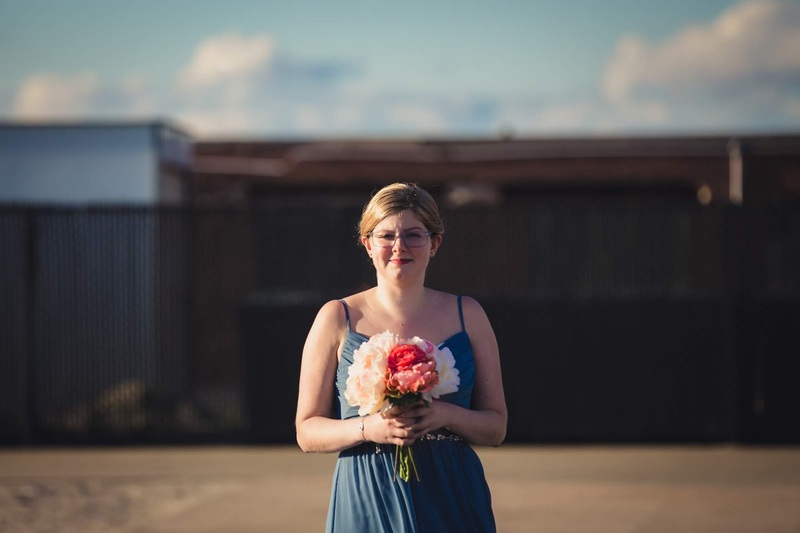 Doing so is a violation of her copyright law. 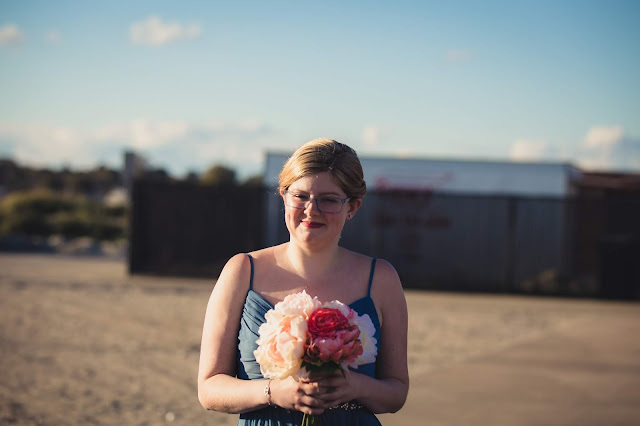 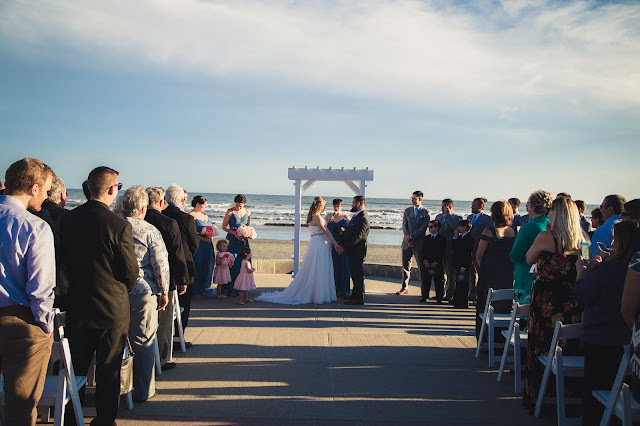 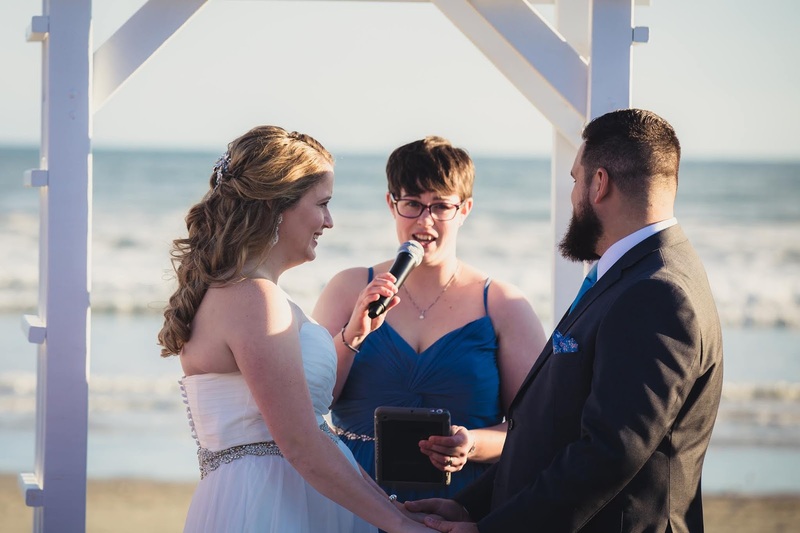 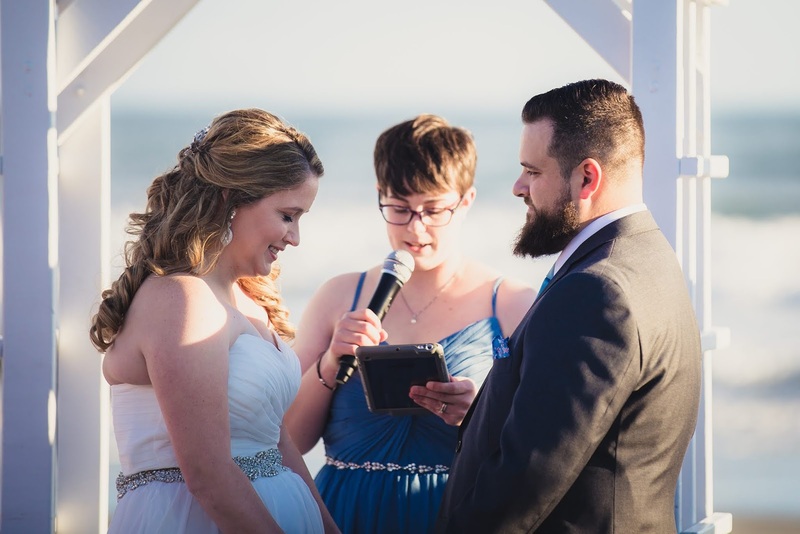 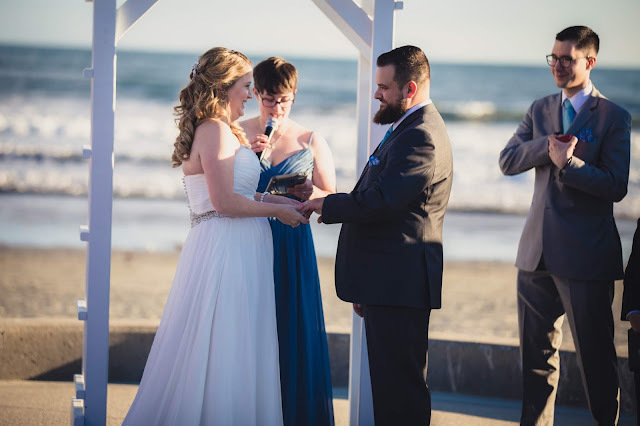 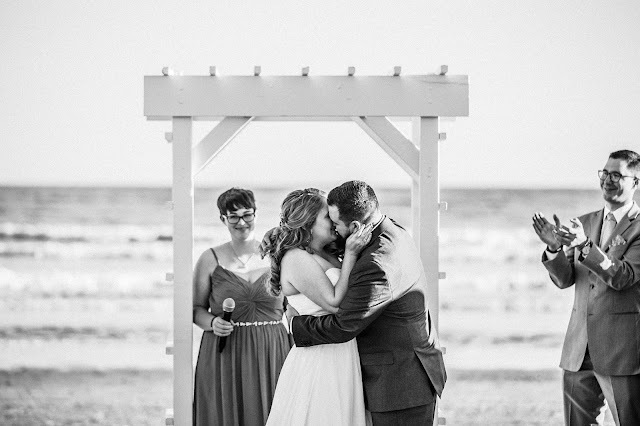 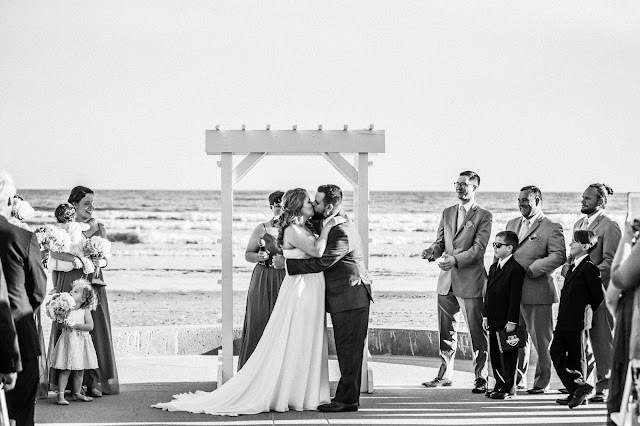 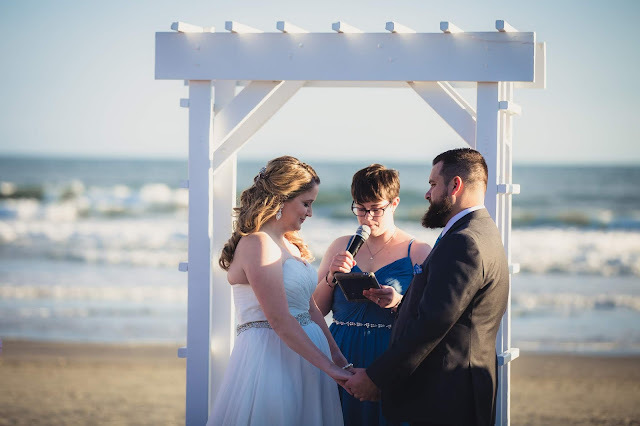 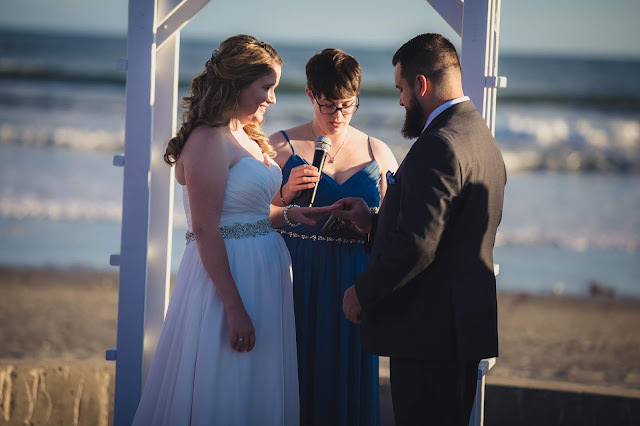 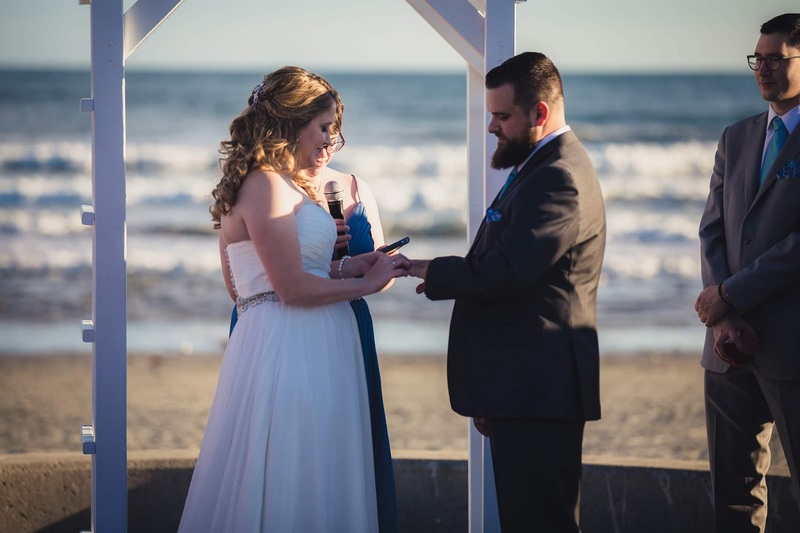 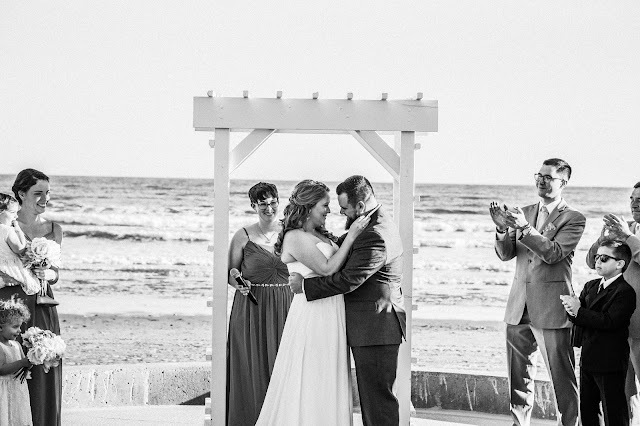 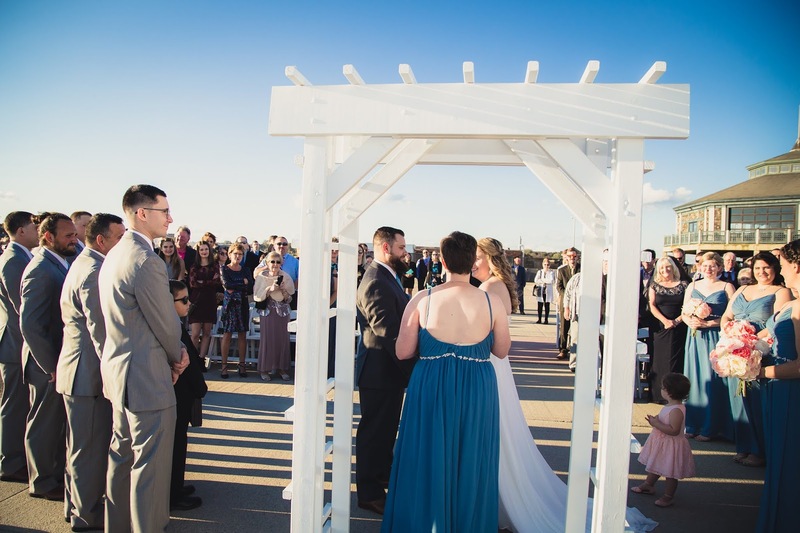 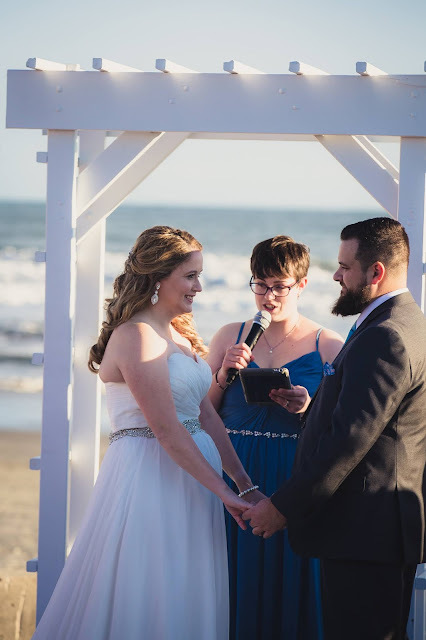 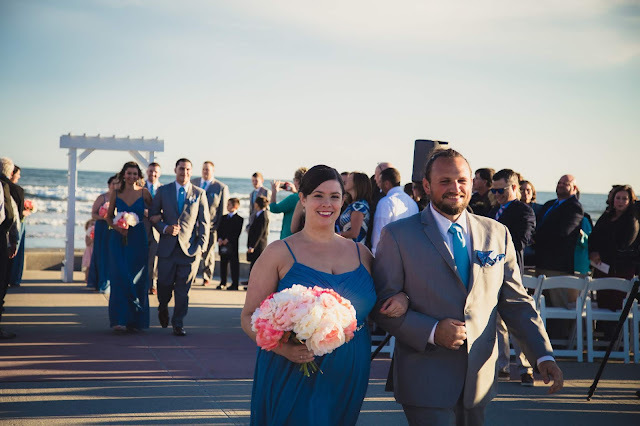 The fact that our ceremony was taking place outdoors and it was absolutely gorgeous out was beyond my wildest dreams. 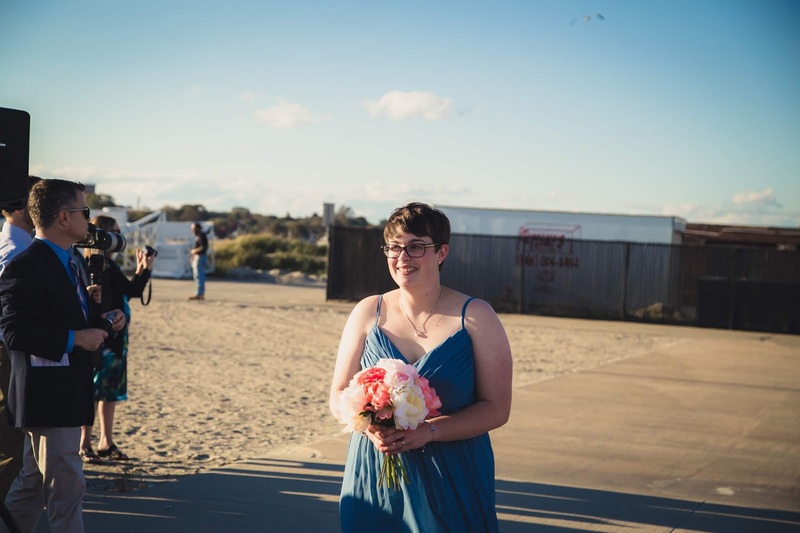 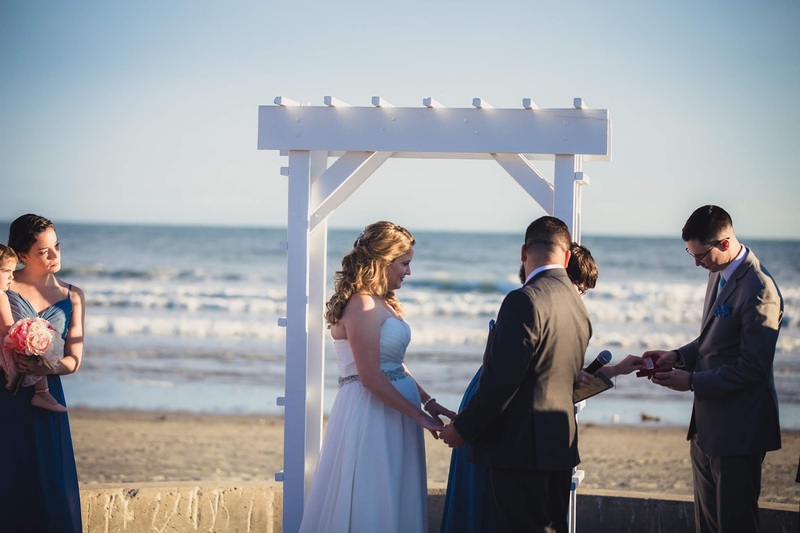 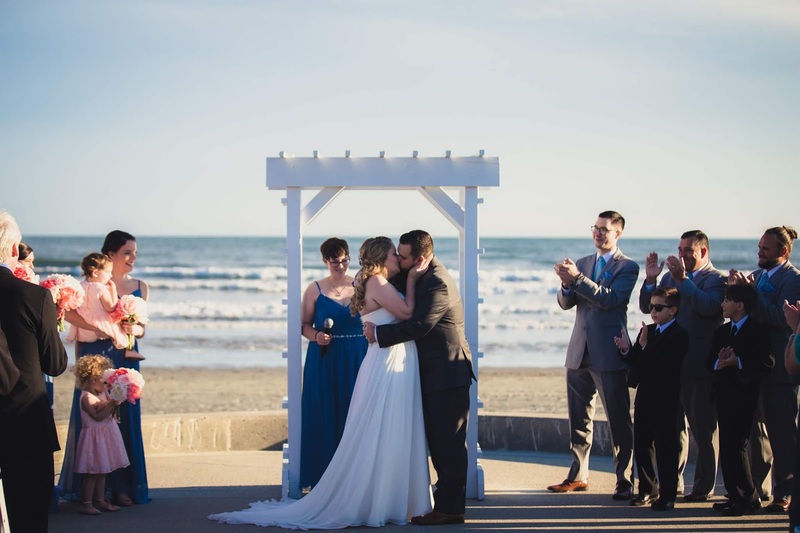 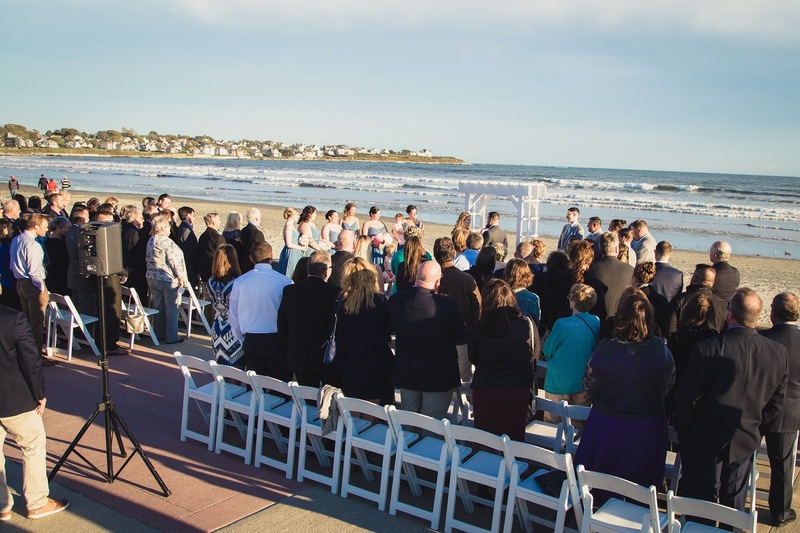 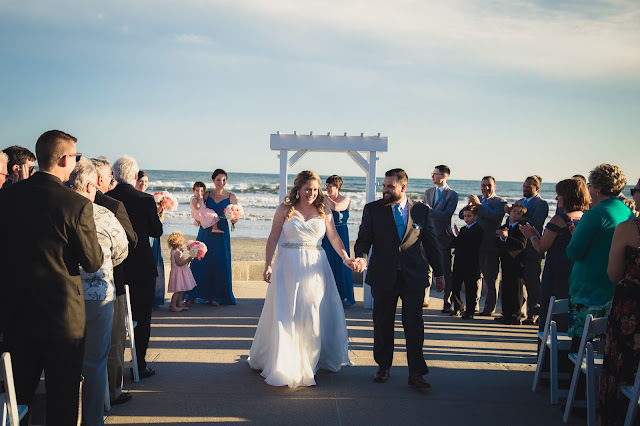 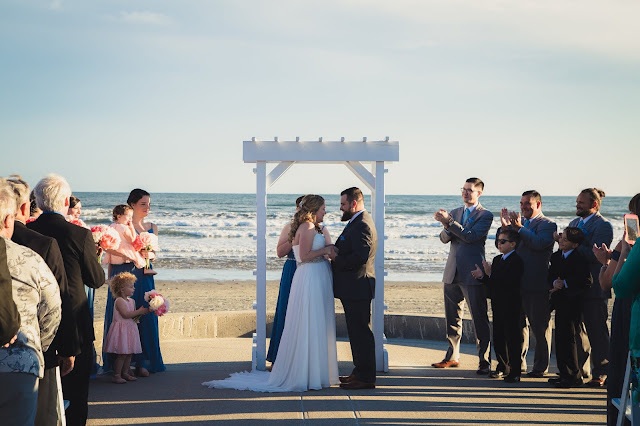 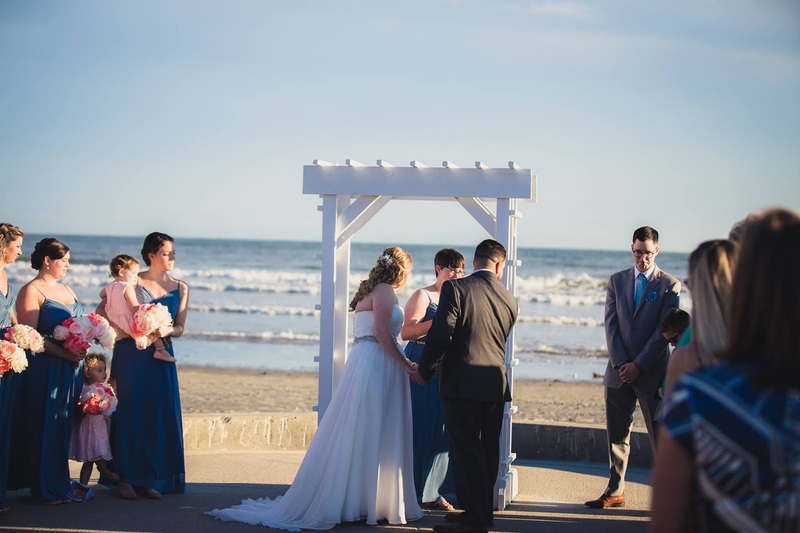 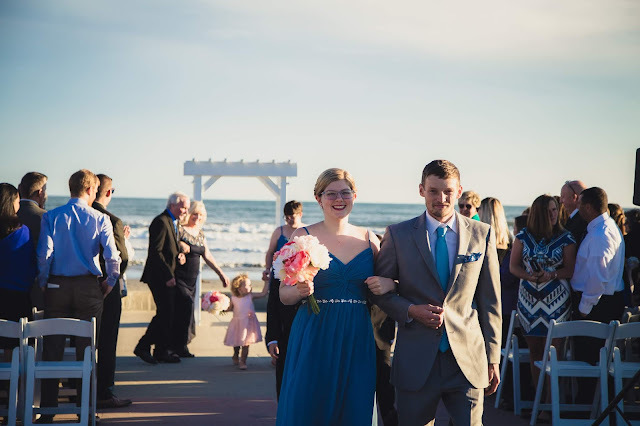 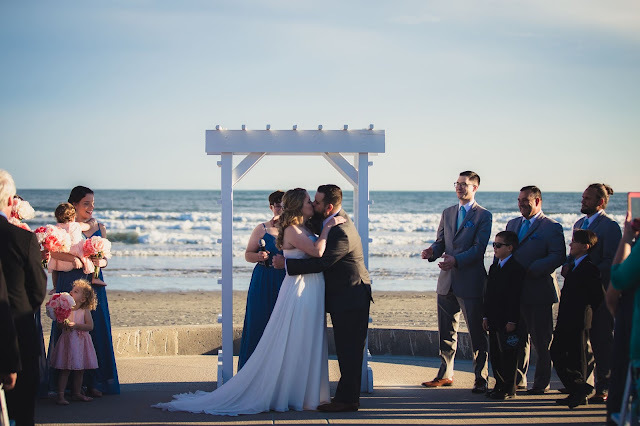 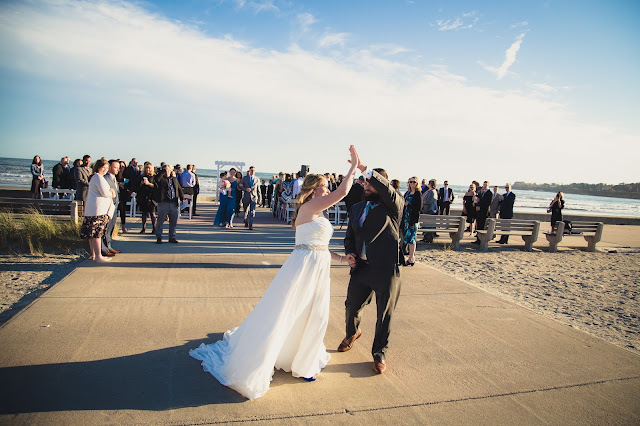 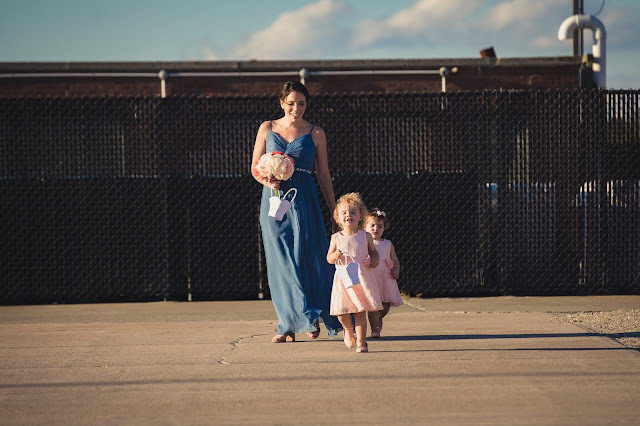 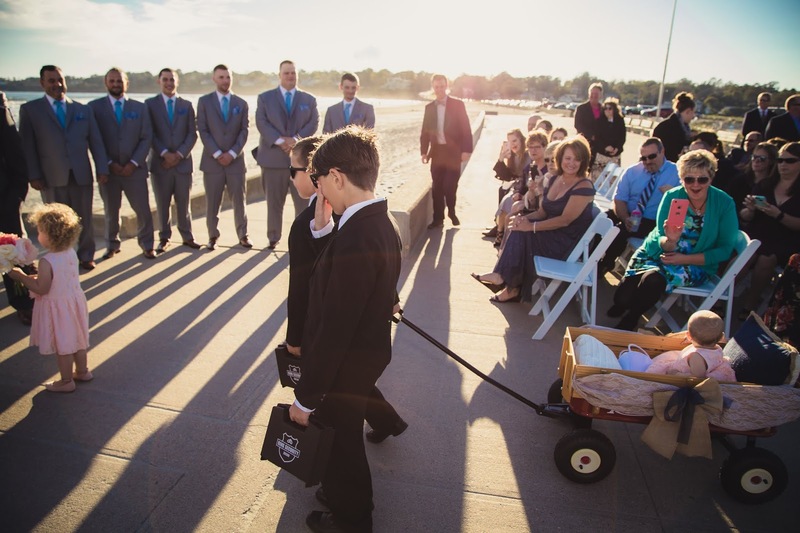 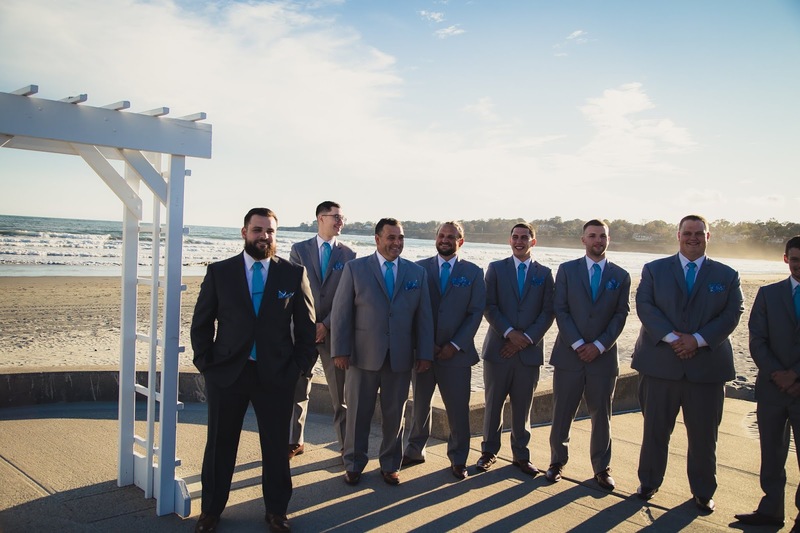 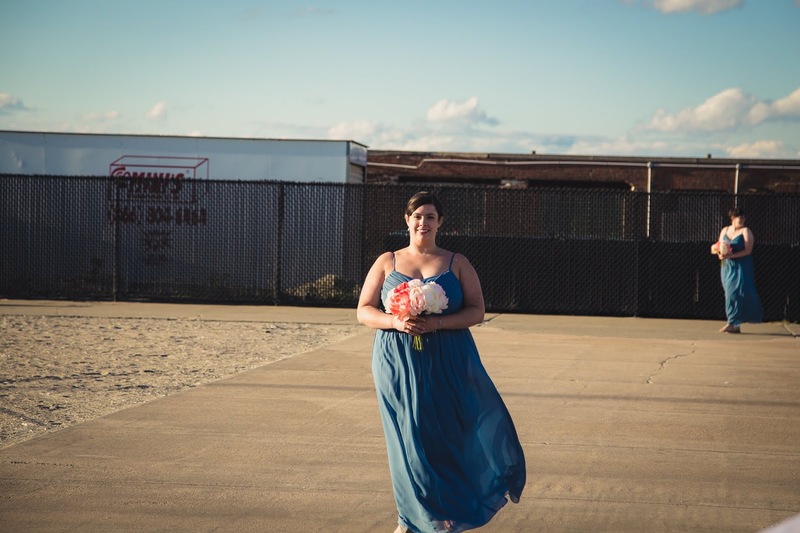 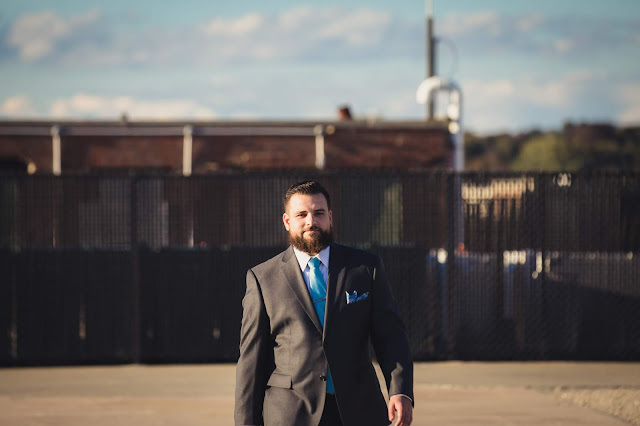 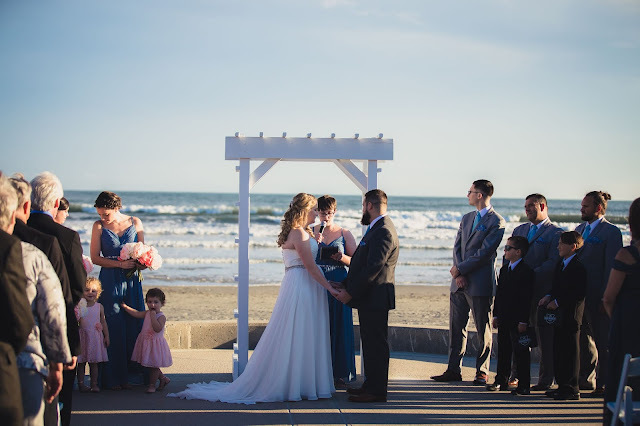 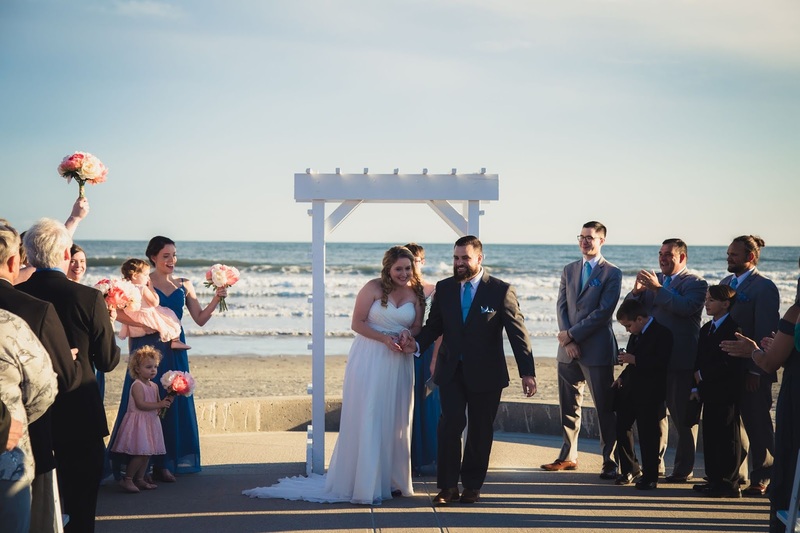 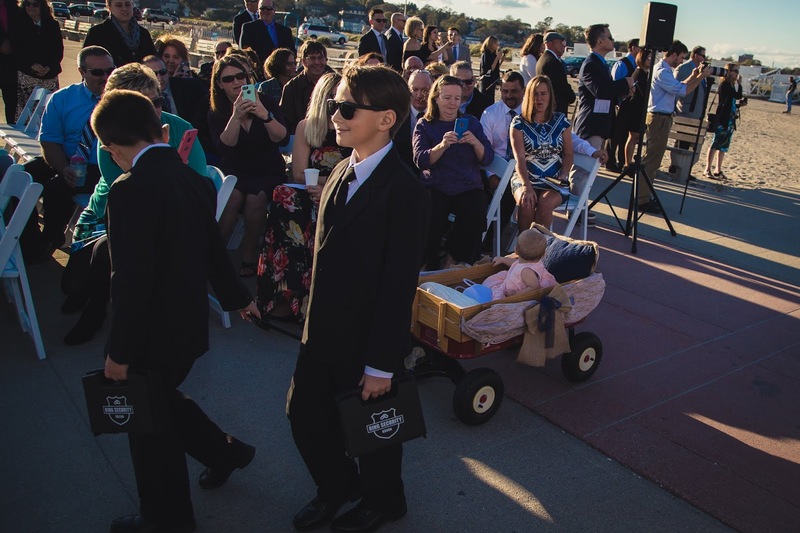 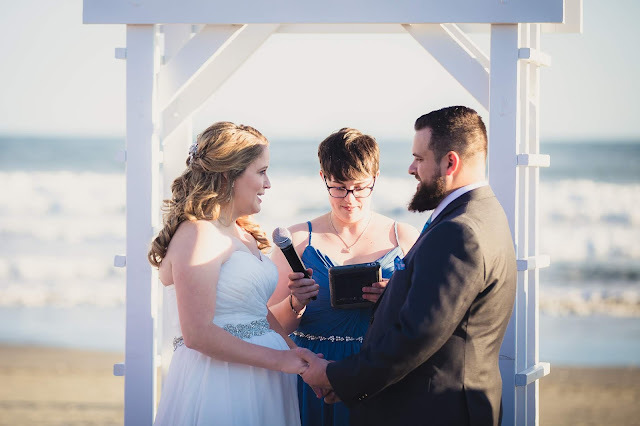 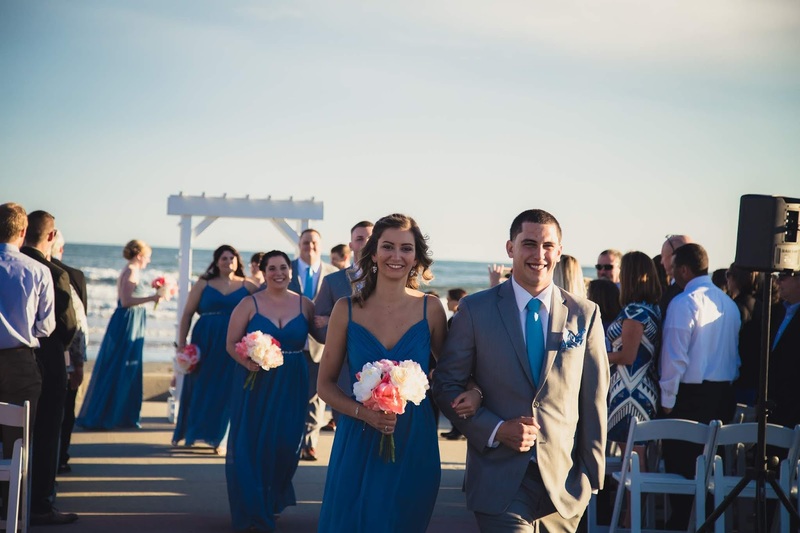 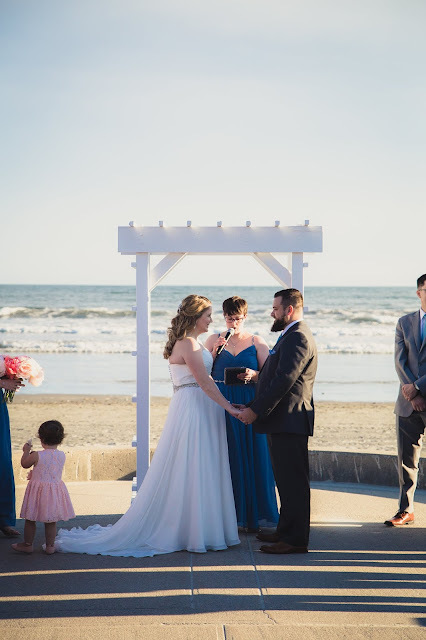 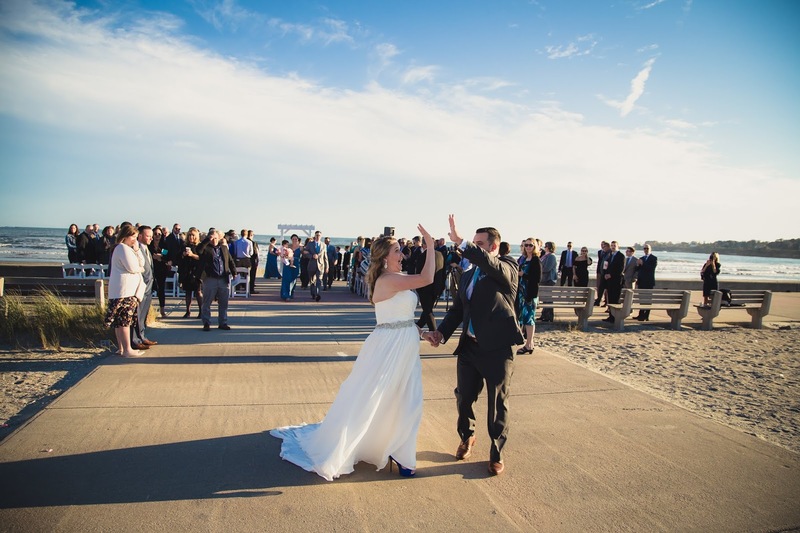 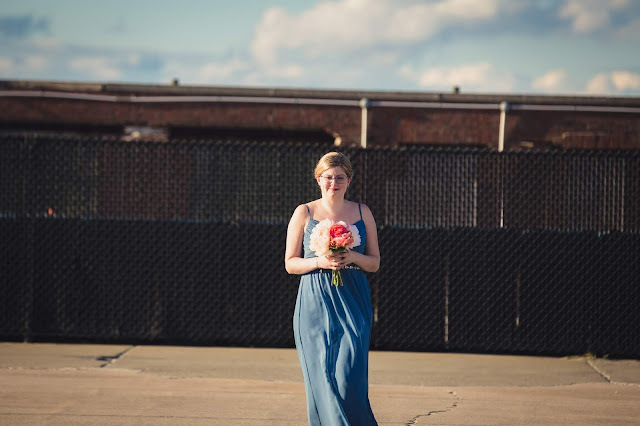 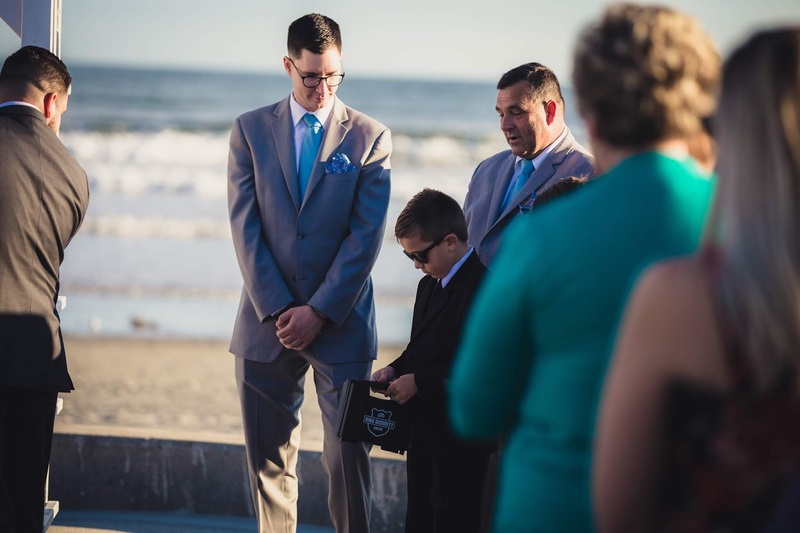 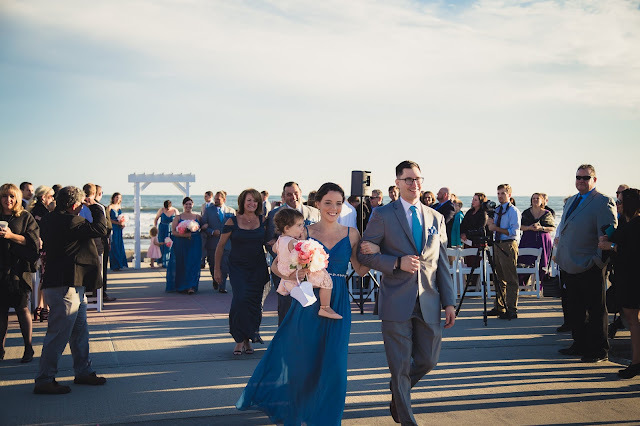 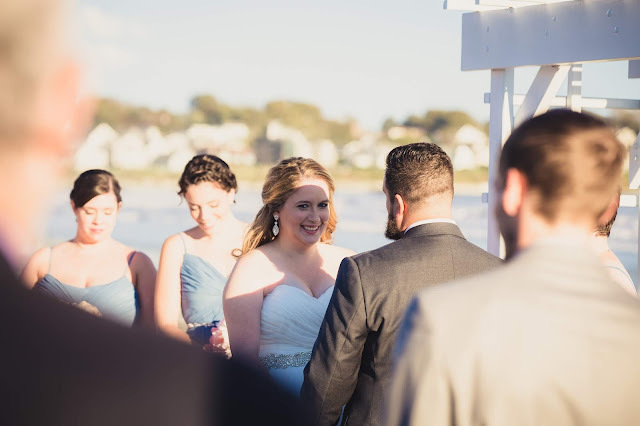 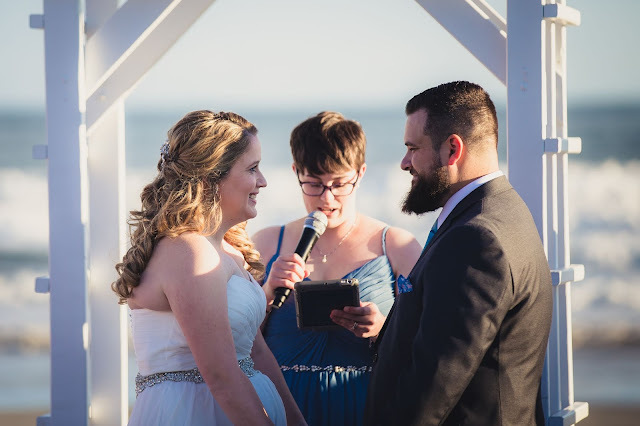 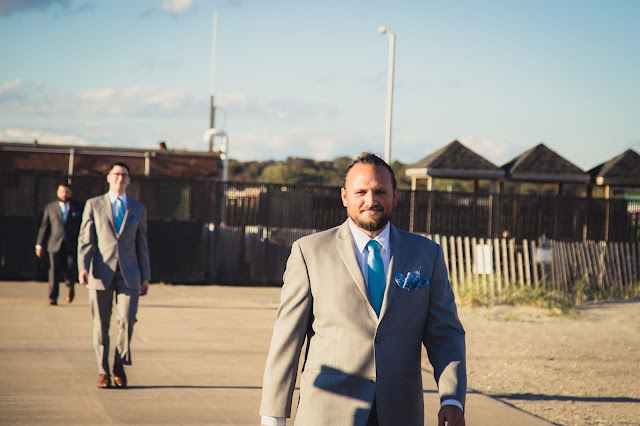 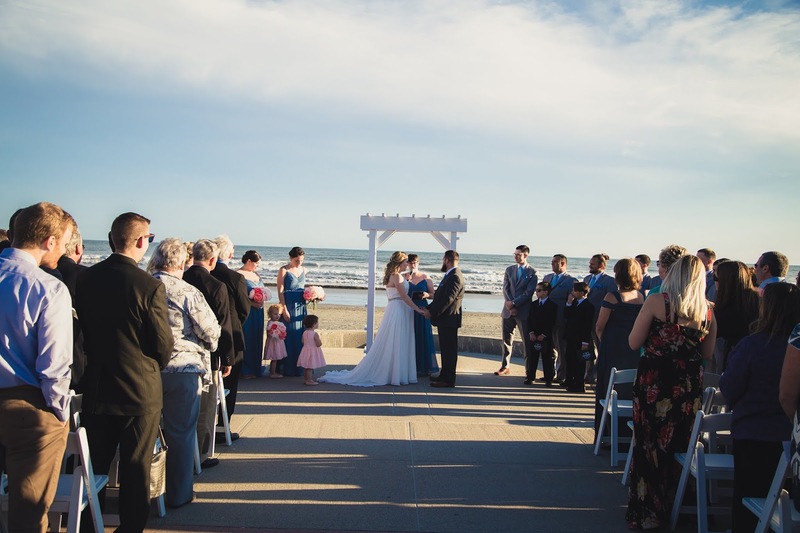 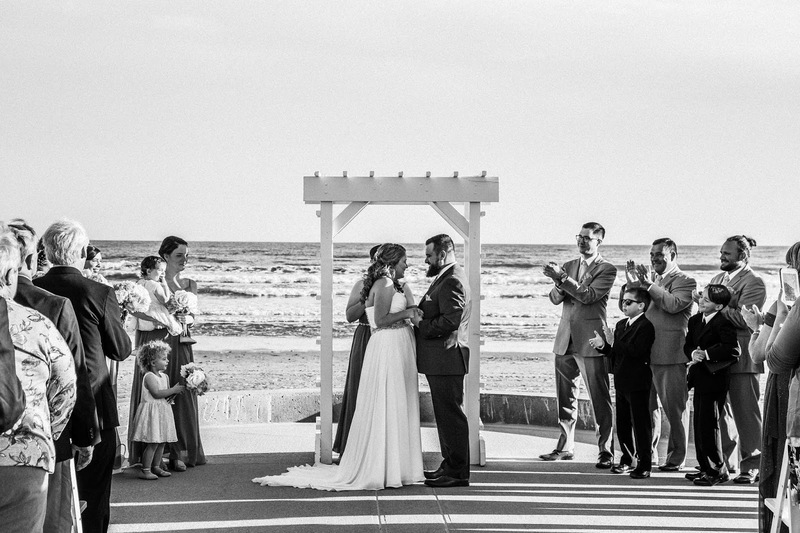 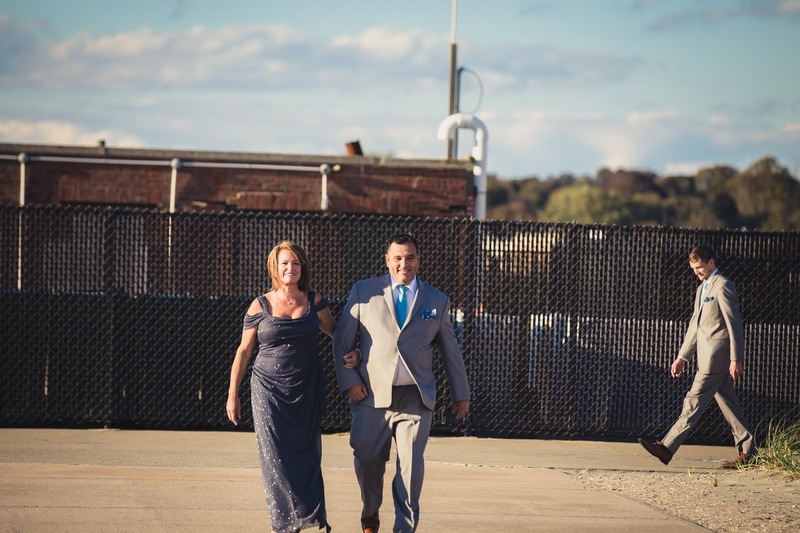 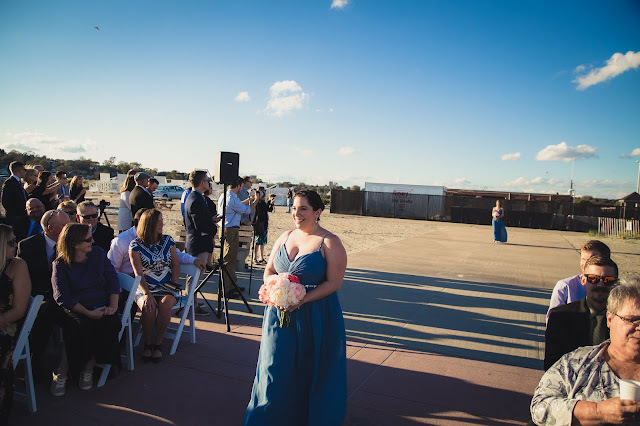 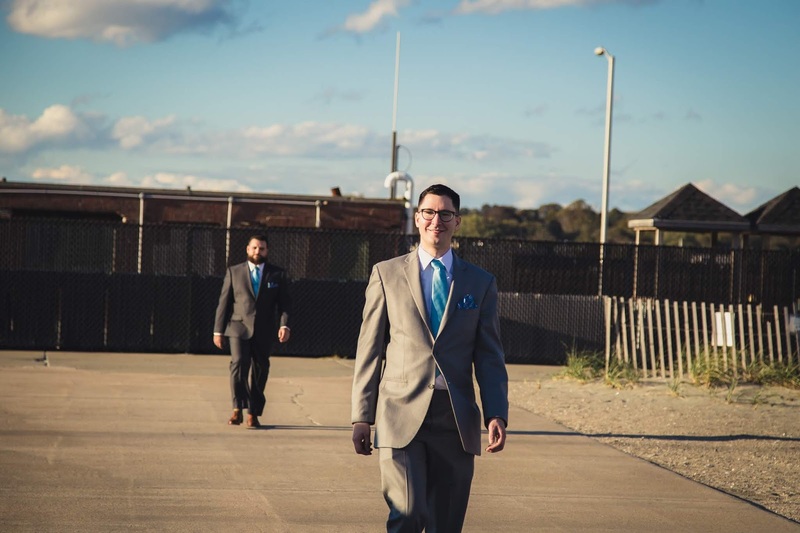 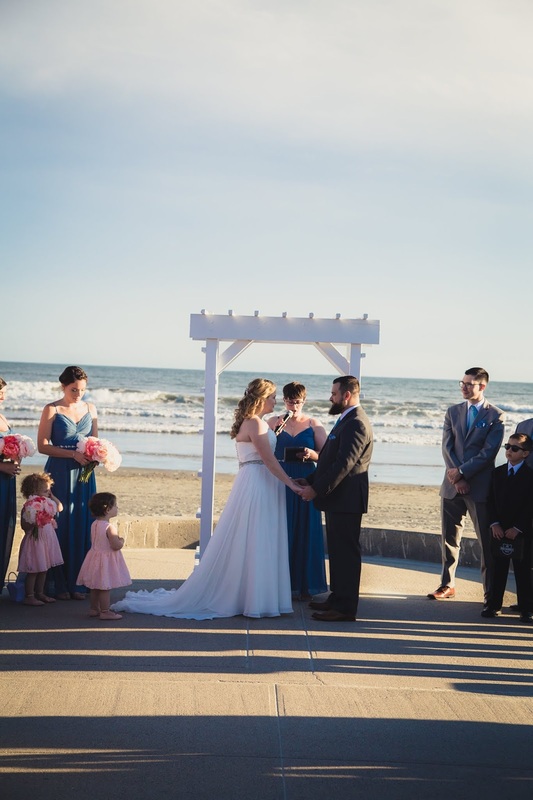 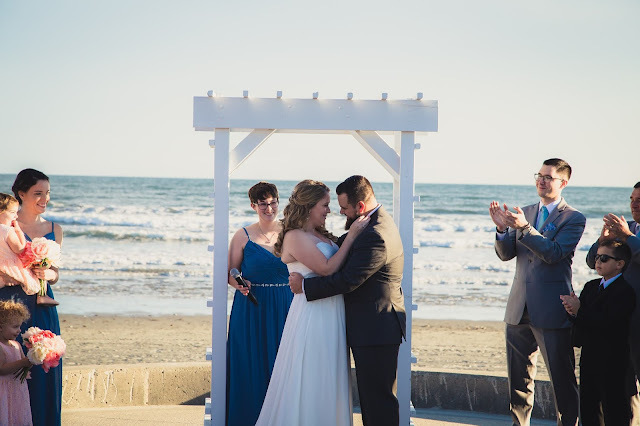 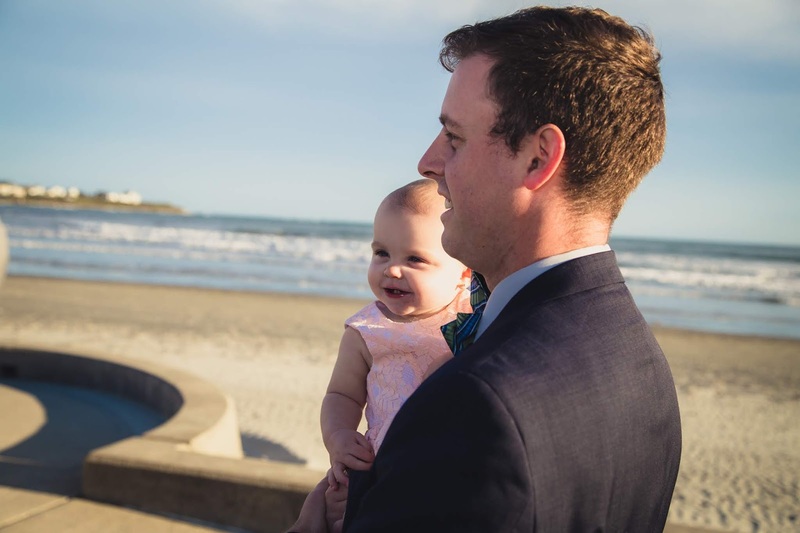 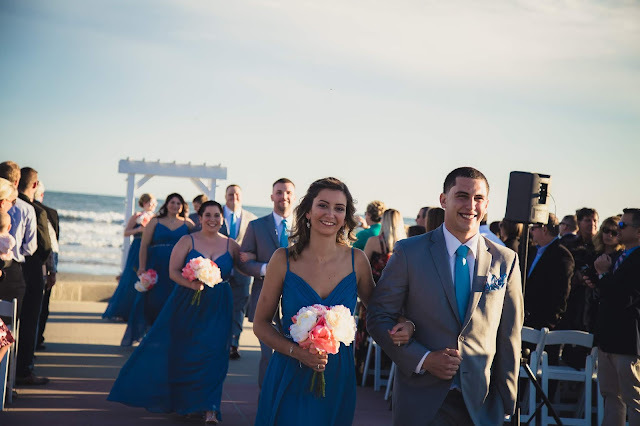 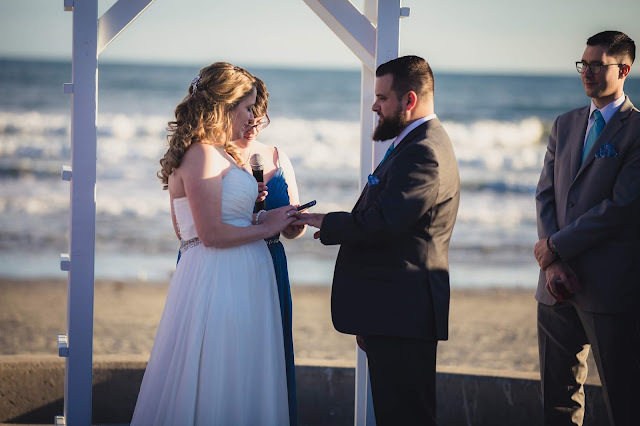 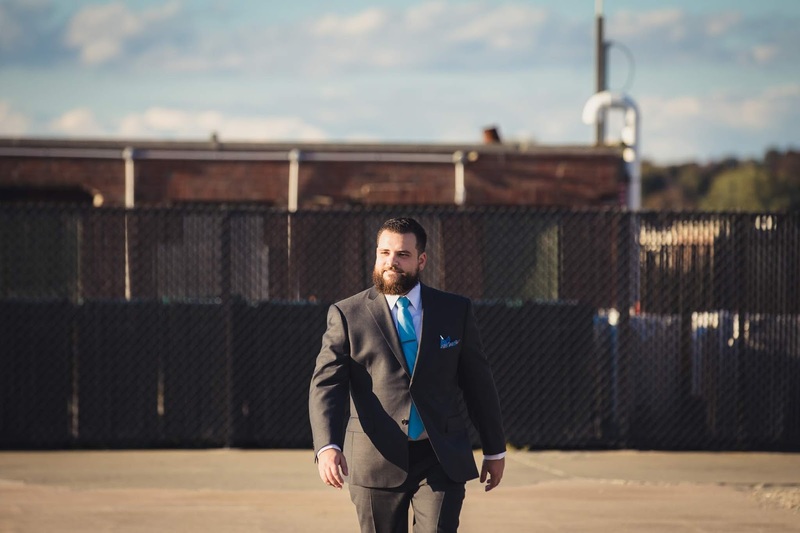 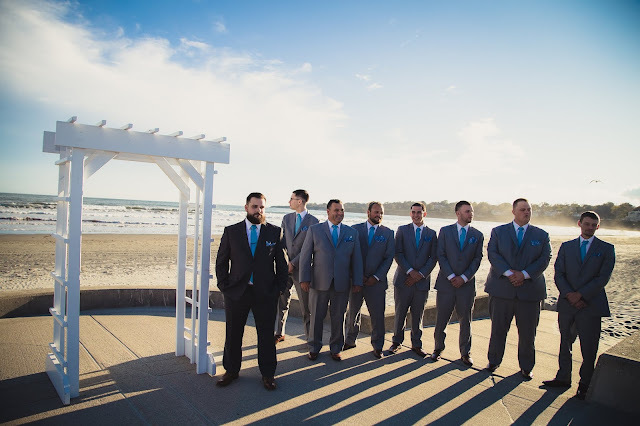 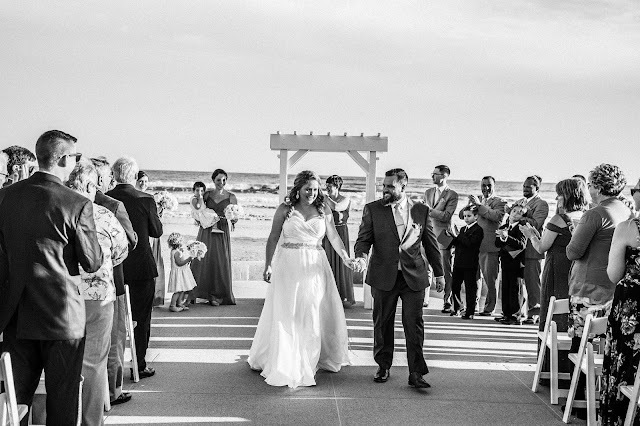 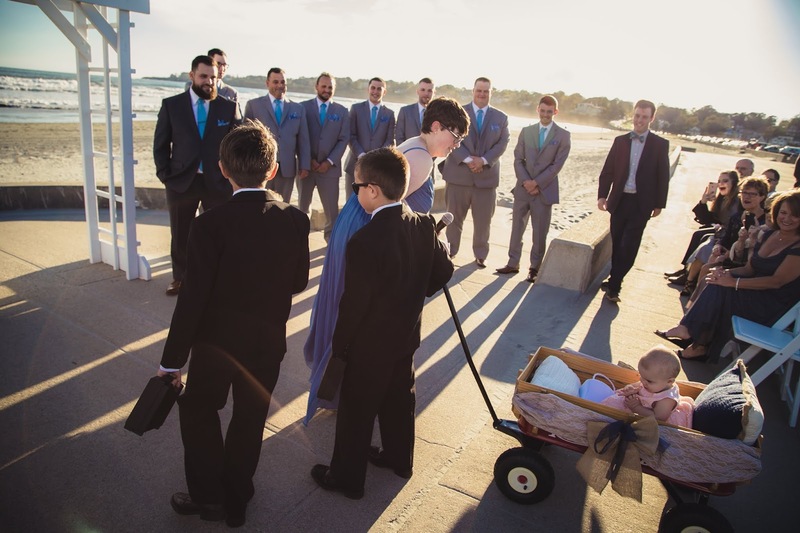 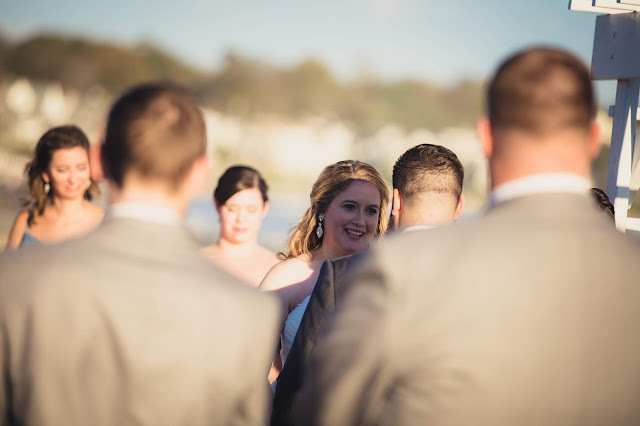 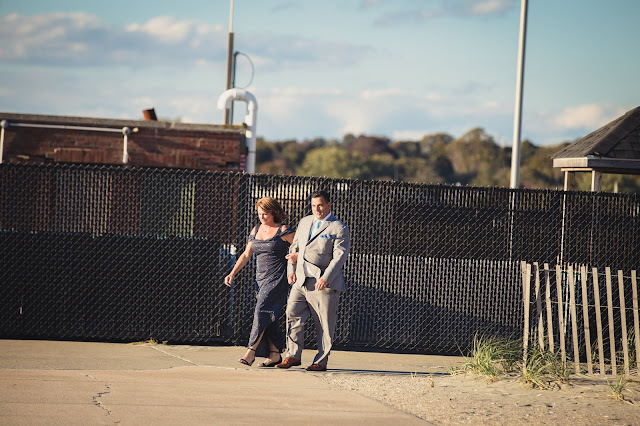 I knew we were taking a gamble having an outdoor ceremony in October but I was determined and the 65 degree sunny weather in Rhode Island was unbelievable. 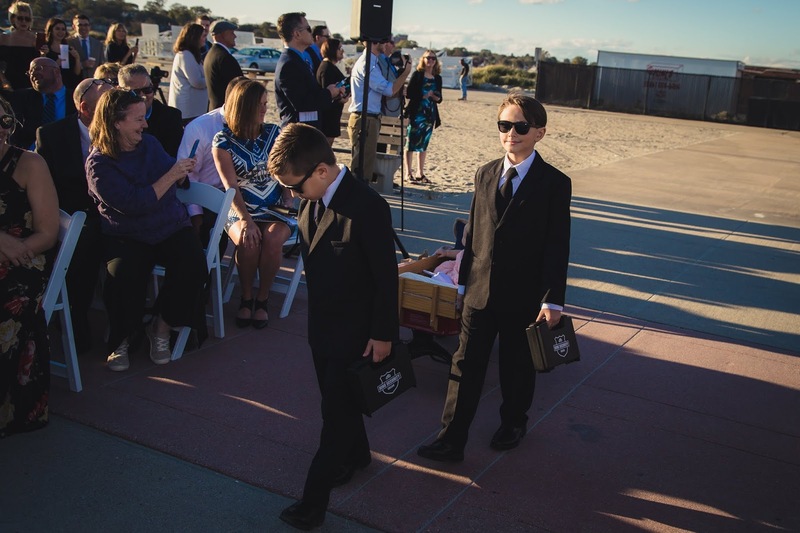 I had an extensive order for everyone to walk down the aisle. 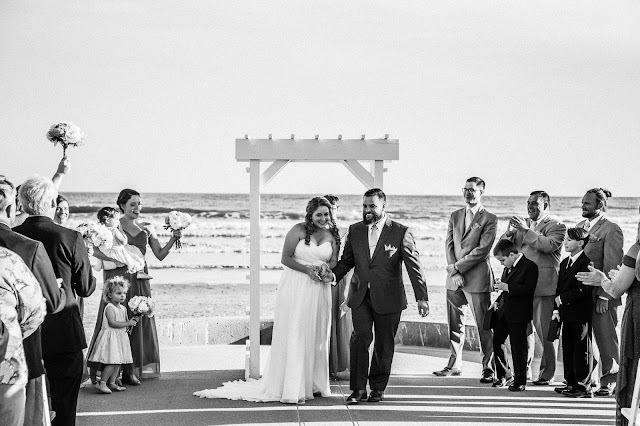 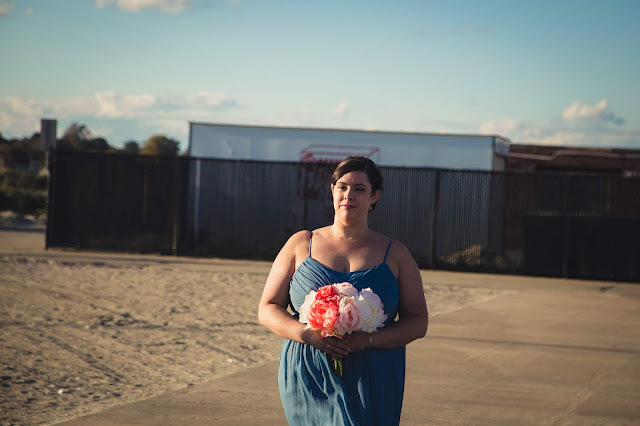 I knew that I wanted everyone who was in the wedding to get to walk down the aisle which isn't always typical. 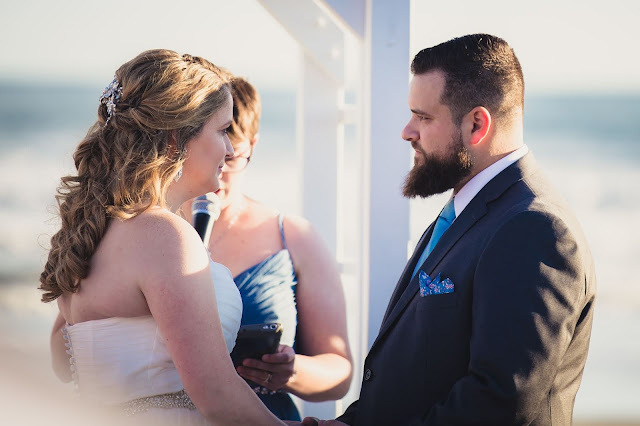 This meant our precession was a bit longer then most but it was very important to me. 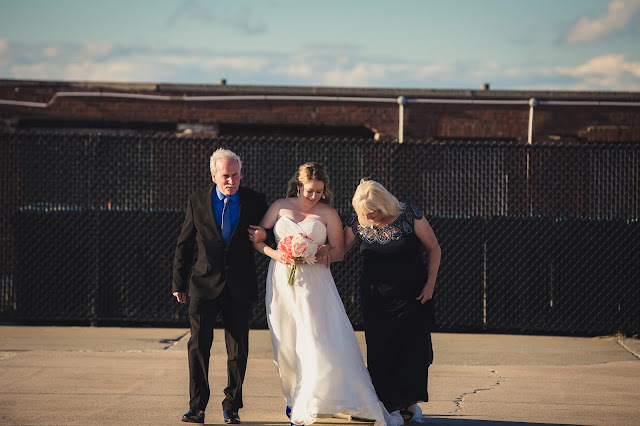 First down the aisle were Tim's parents. 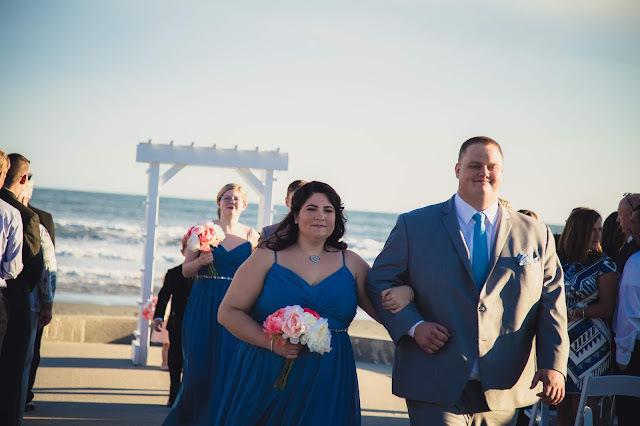 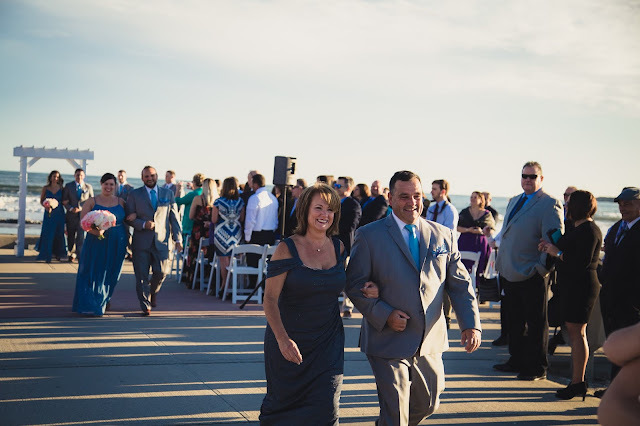 Tim's dad was a groomsman so he would've walked down the aisle anyways but I knew I wanted him to walk with Tim's mom so she had the chance to shine too! Next up, the groomsmen. 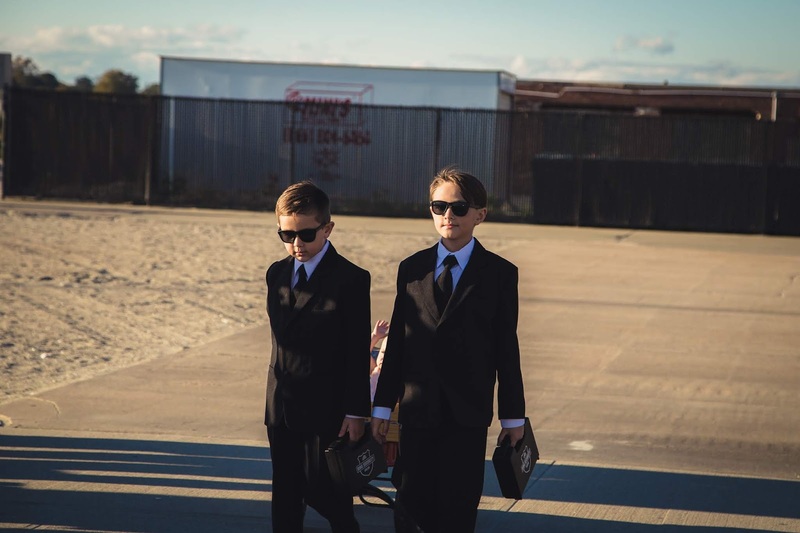 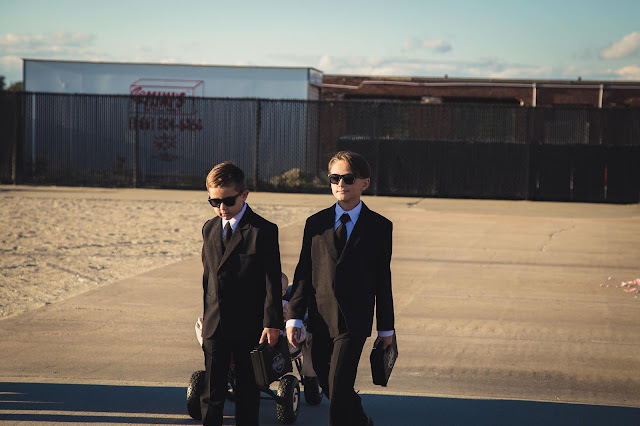 They headed down the aisle in reverse order of where they stood next to Tim. 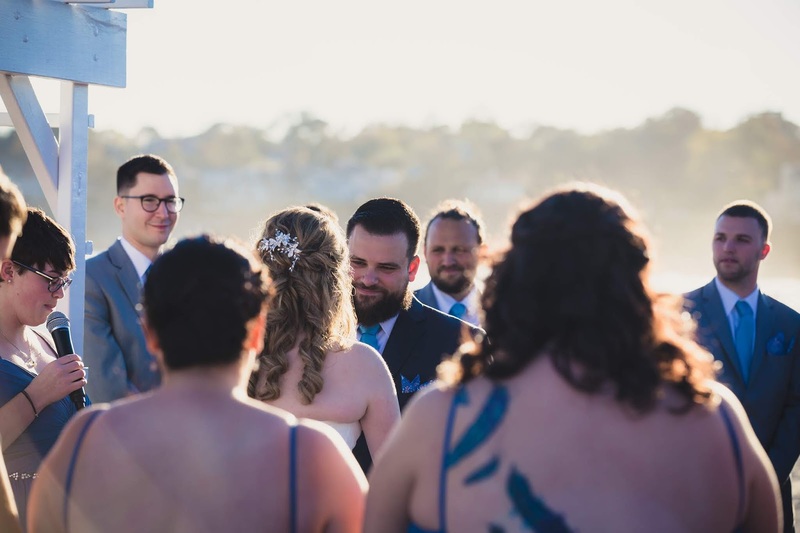 Then Tim's dad just jumped in his spot while everyone watched them come down the aisle. 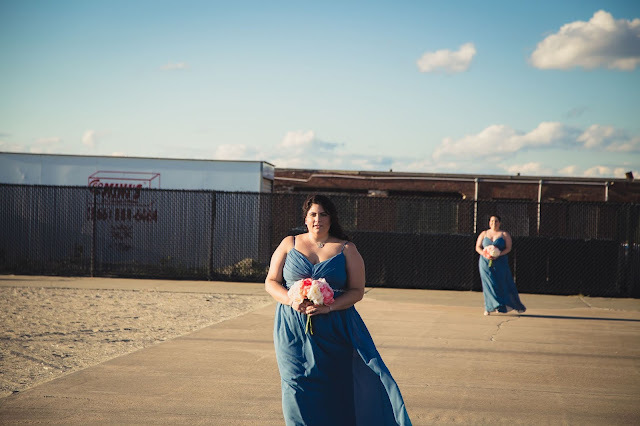 For some reason Tim's pictures coming down the aisle are next in the photos I received. 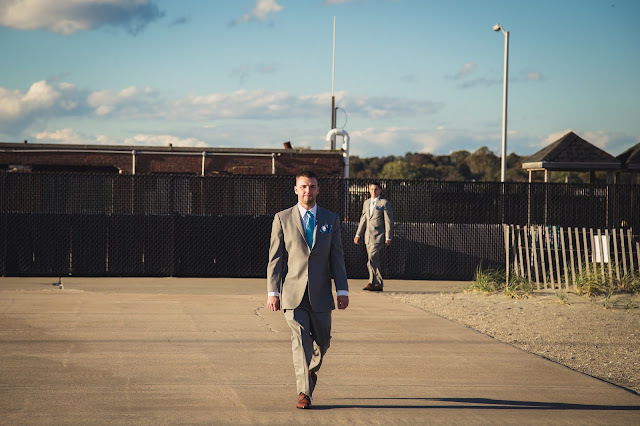 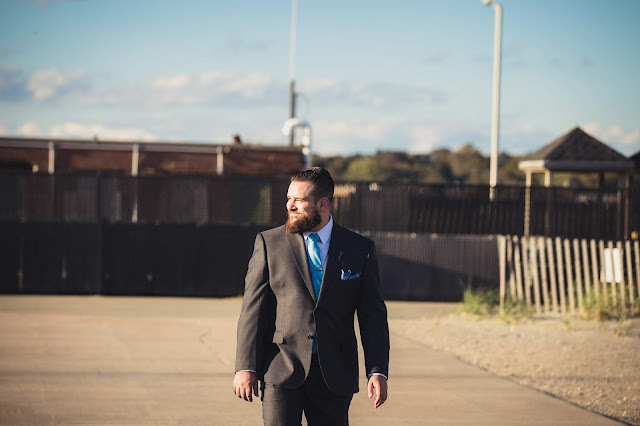 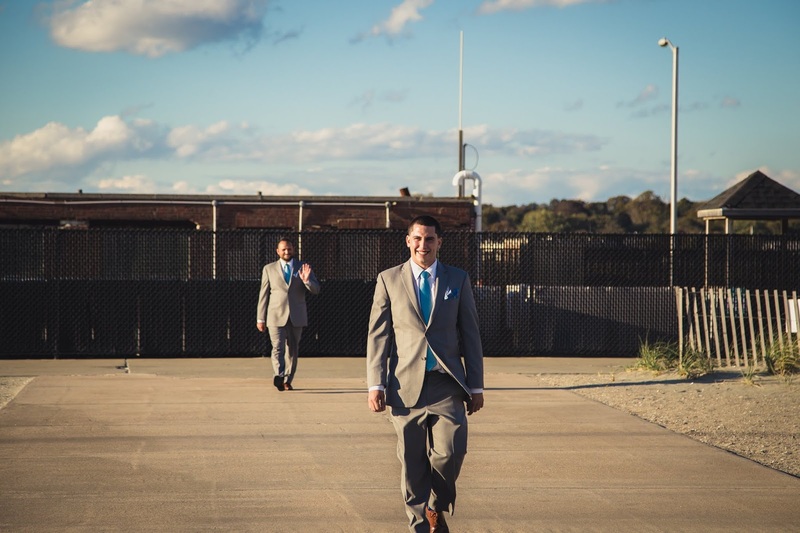 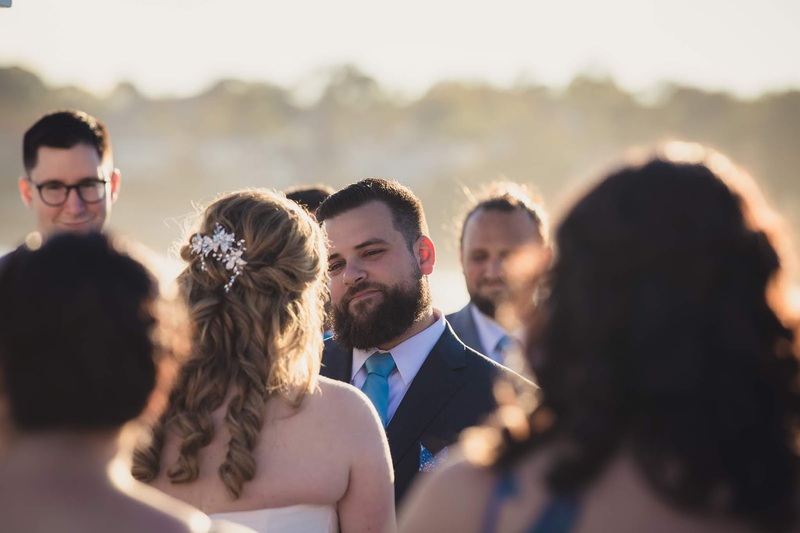 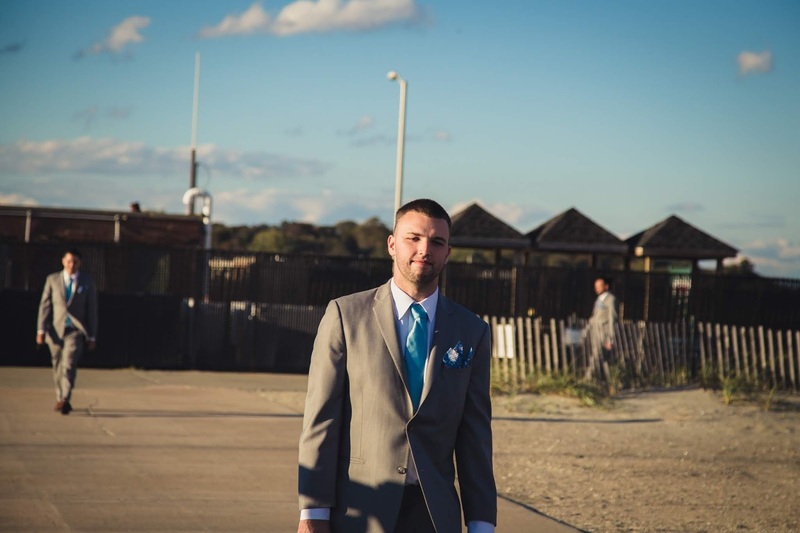 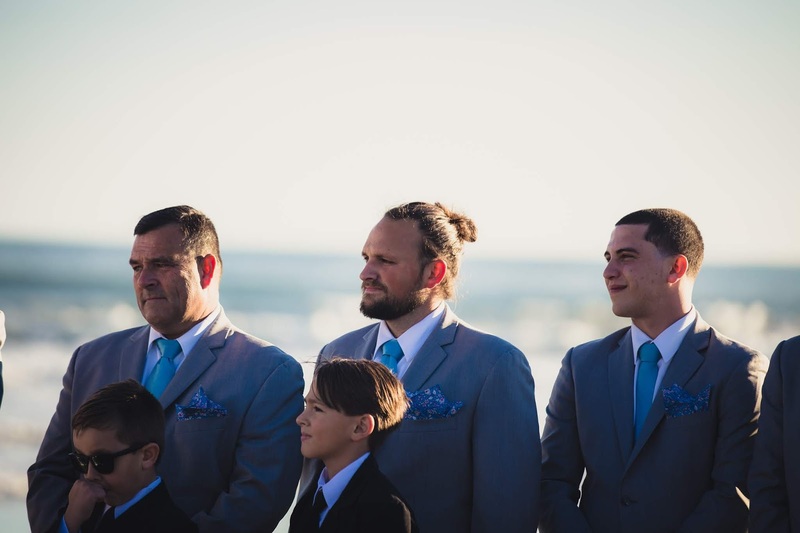 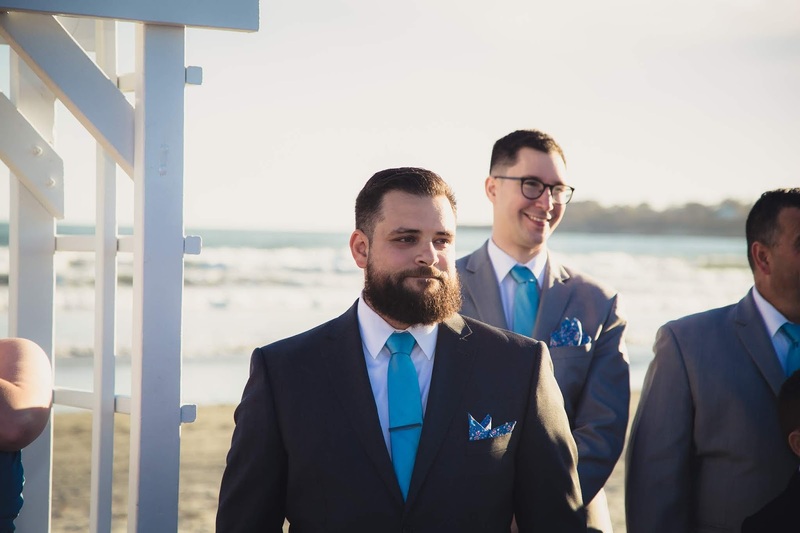 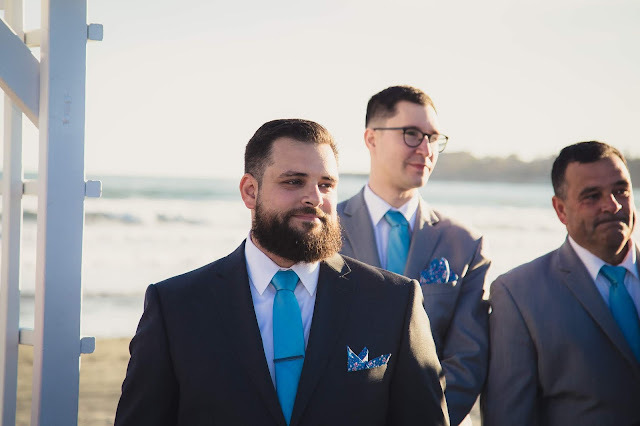 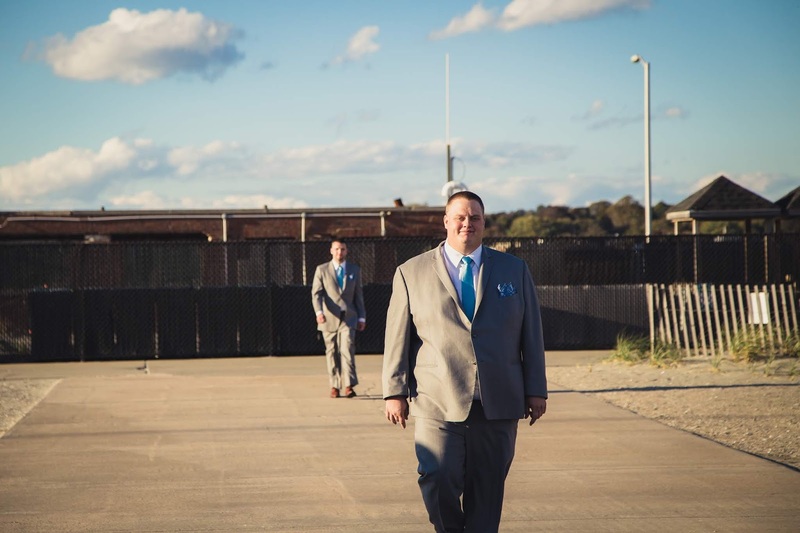 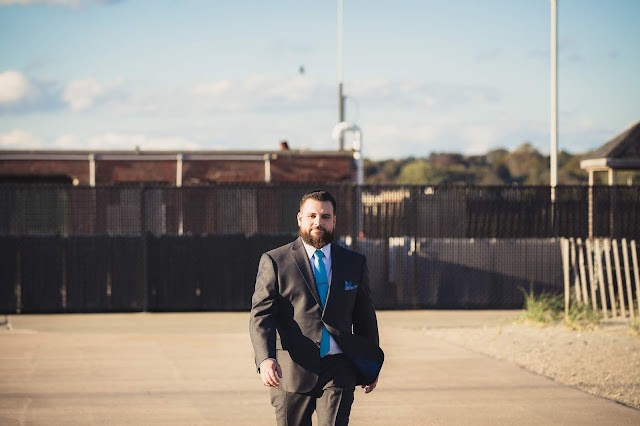 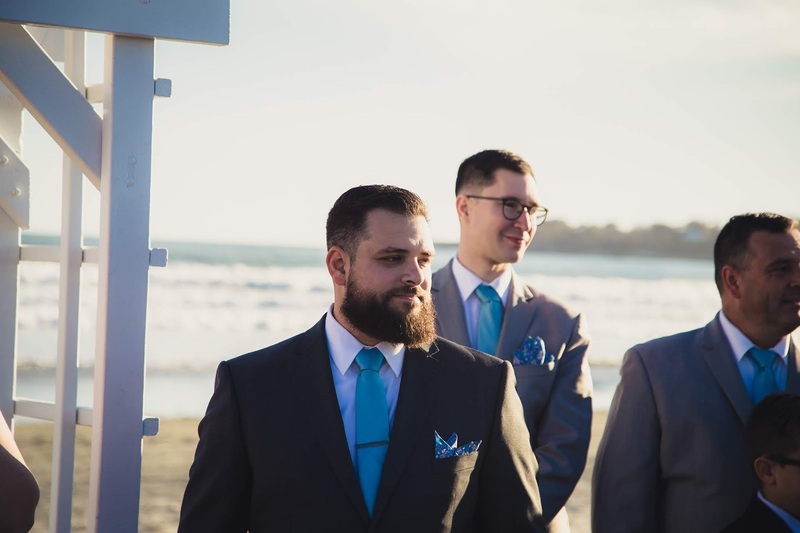 Doesn't my husband look like a model coming down the aisle?! 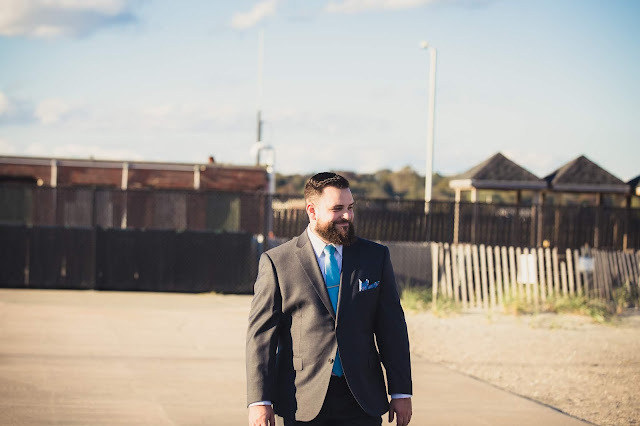 What a handsome guy. I can tell he was a little nervous but I'm so glad he got the chance to walk down the aisle and wasn't just standing up in the front like many grooms do. 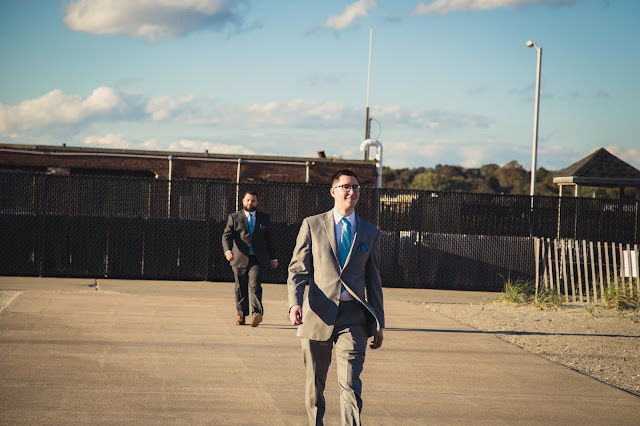 I have to say everyone did an amazing job staying spaced out and taking their time walking. 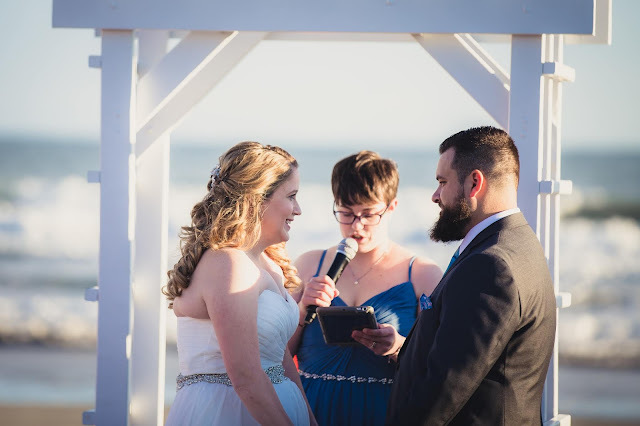 We also had the wonderful Jen Strunk helping us with timing so we didn't have too much of a chance to do much wrong. 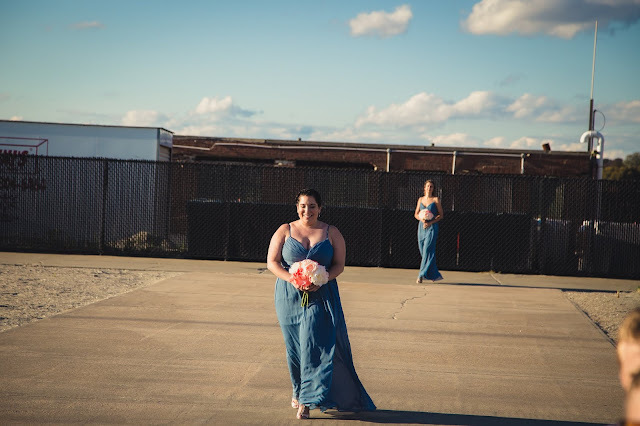 Also, how gorgeous are my bridesmaids? I am so lucky that I have such supportive, wonderful girlfriends who were there for me on that day, and every day since! We struggled a little bit getting Tilly to want to go down the aisle but luckily her mom was right there as my MOH to walk with her! Emma headed down the aisle with them too and did enough flower petal dumping for both of them! 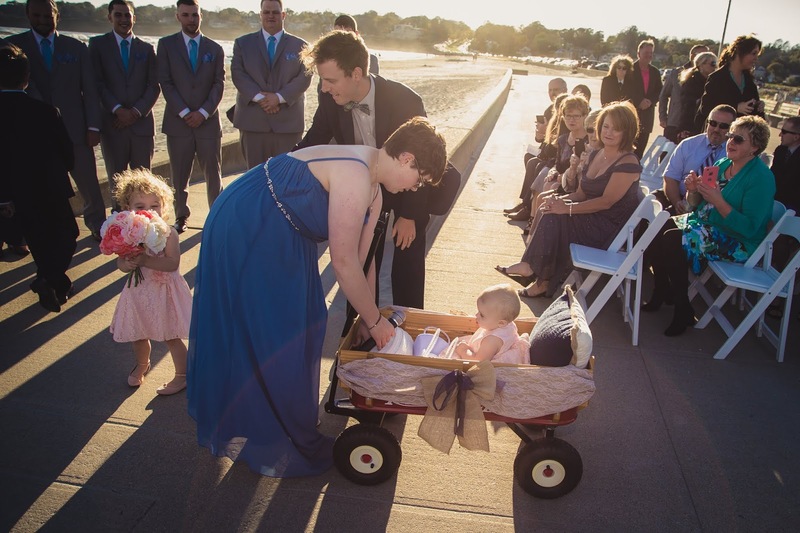 Right behind Rachel, Emma and Tilly were Kason and Callan with Parker in the wagon. 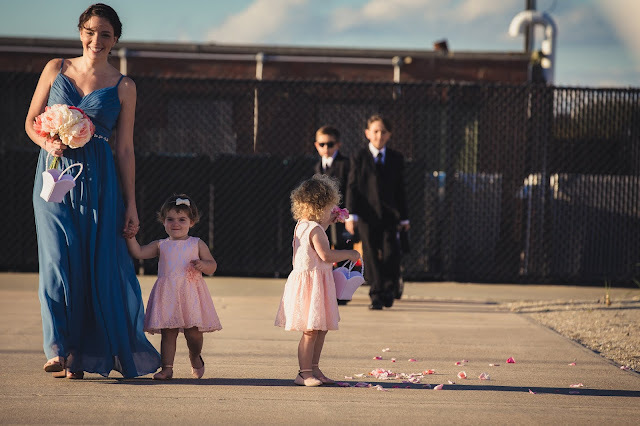 They were all so good! 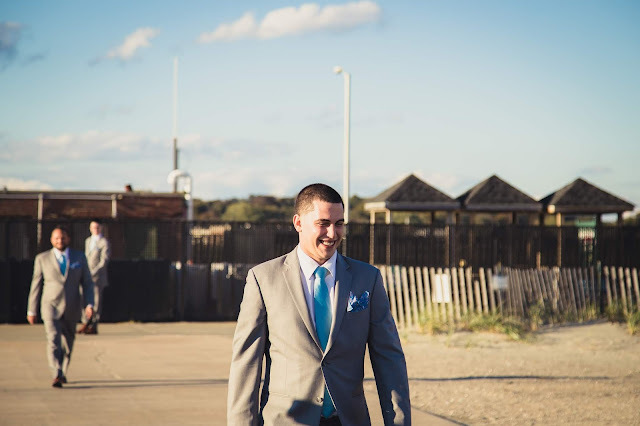 One thing I would change? 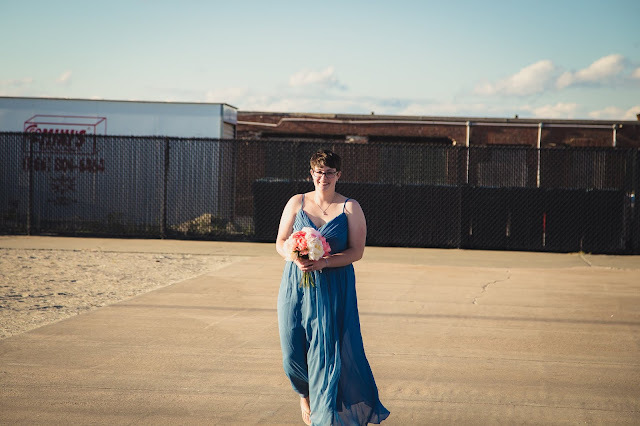 My three inch heels that were insanely uncomfortable and made my feet bleed all over the inside of my dress before the ceremony started. 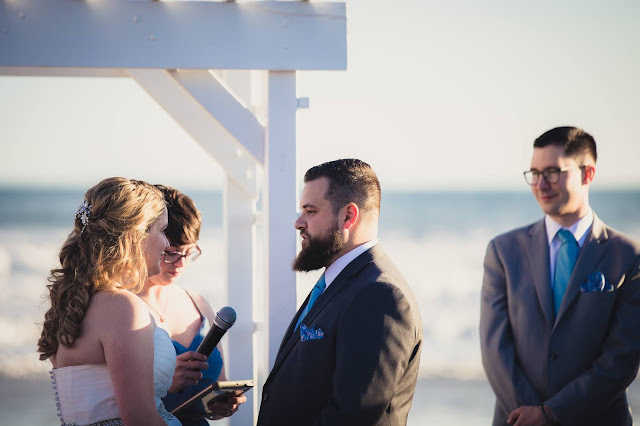 I was much more comfortable in my reception sandals and wish I just wore them the entire time. 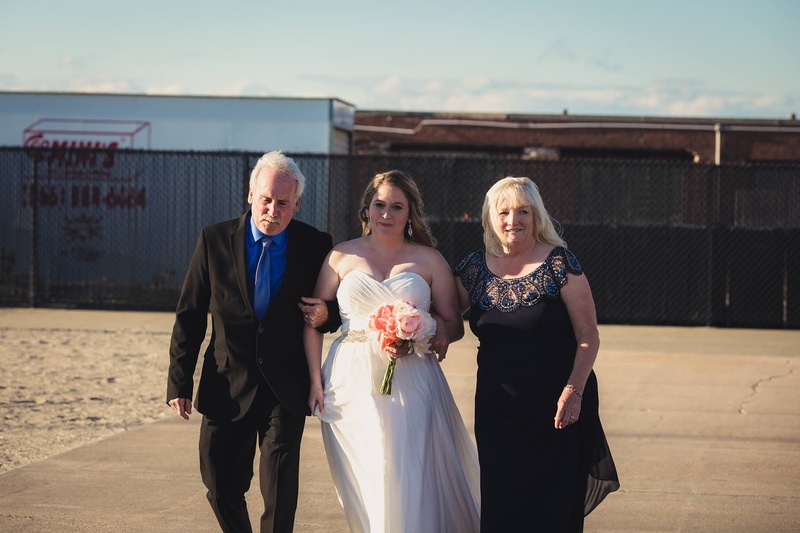 I chose both my parents to walk me down the aisle since they both raised me, I know that some people just have their dads but I always think that's unfair to the mom who raised their daughters as well! 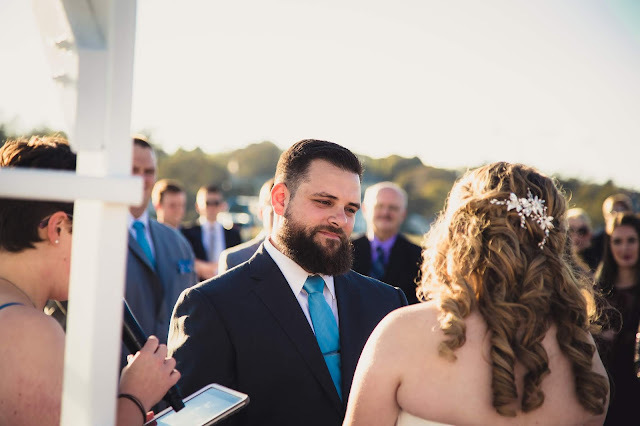 If you ask Tim he will tell you he didn't cry but when I got up to the alter I saw tears in his eyes and this pictures proves it. 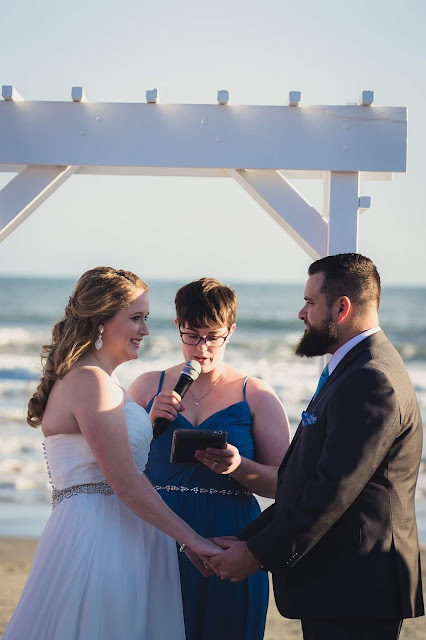 Brittni was the one to marry us which was perfect since she was the one to introduce us. 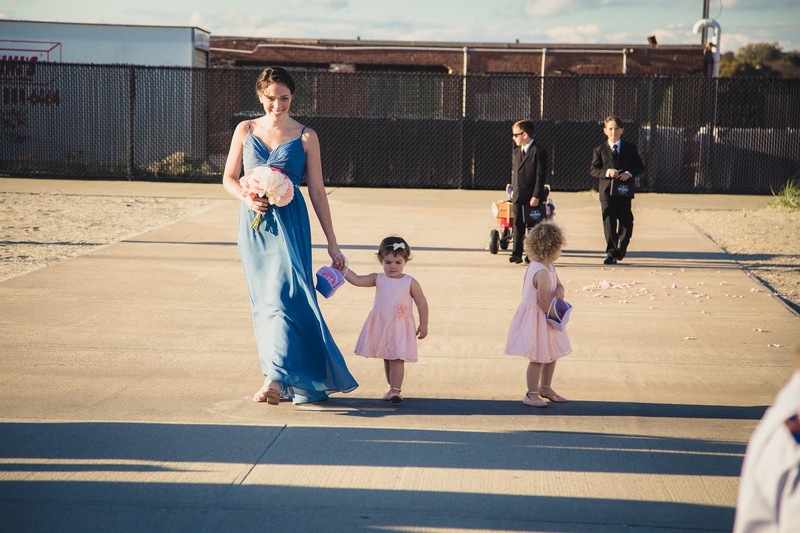 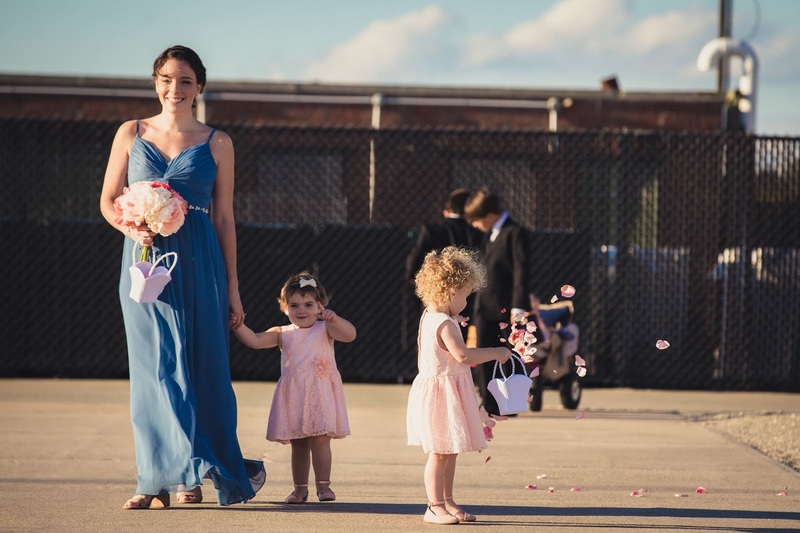 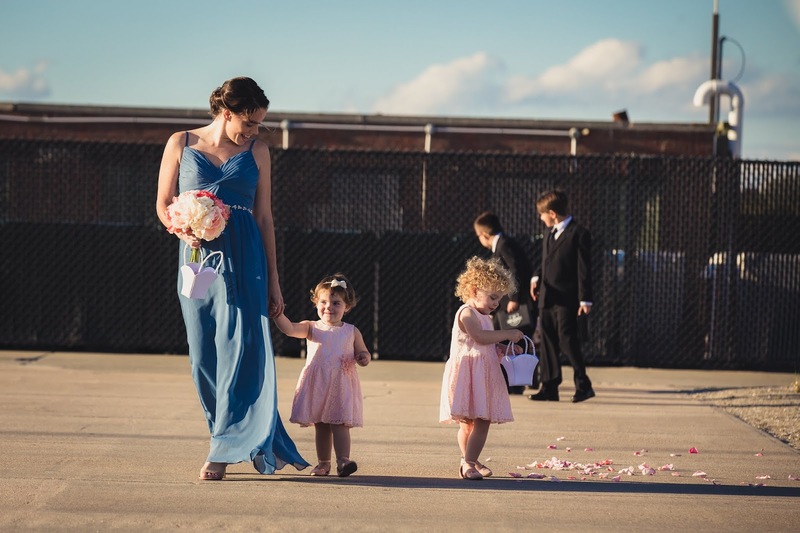 My poor bridesmaids were pretty much blinded through the entire ceremony...but I preferred that to rain or cold! 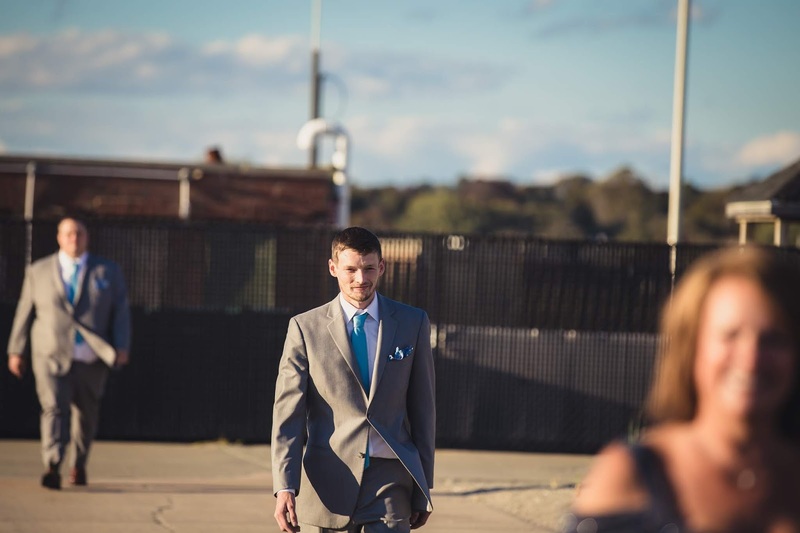 Sorry ladies! 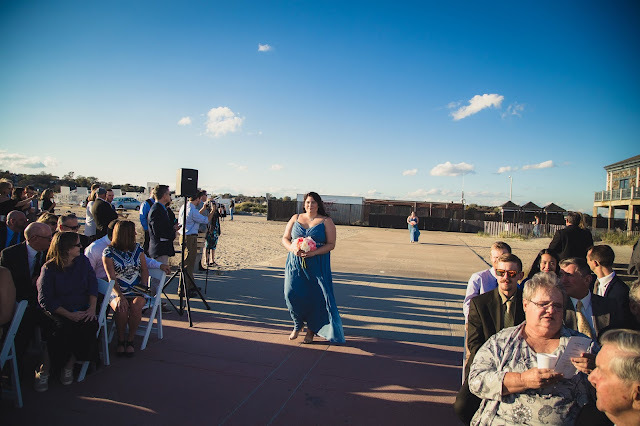 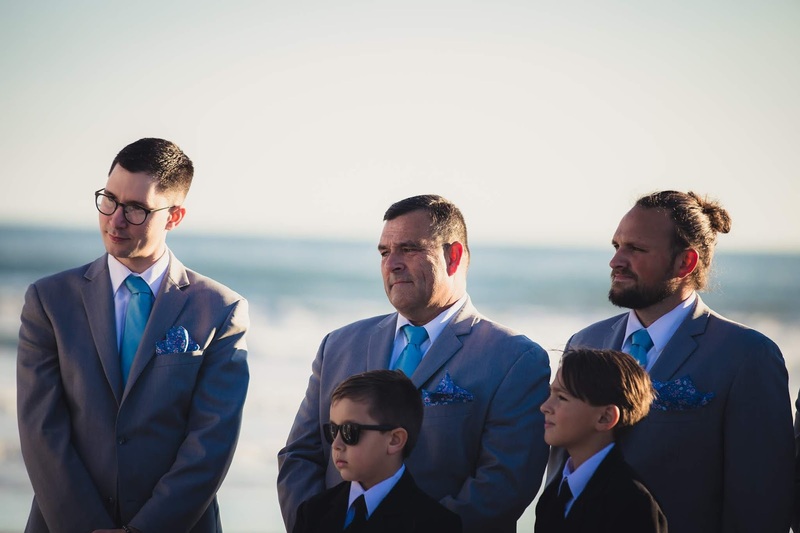 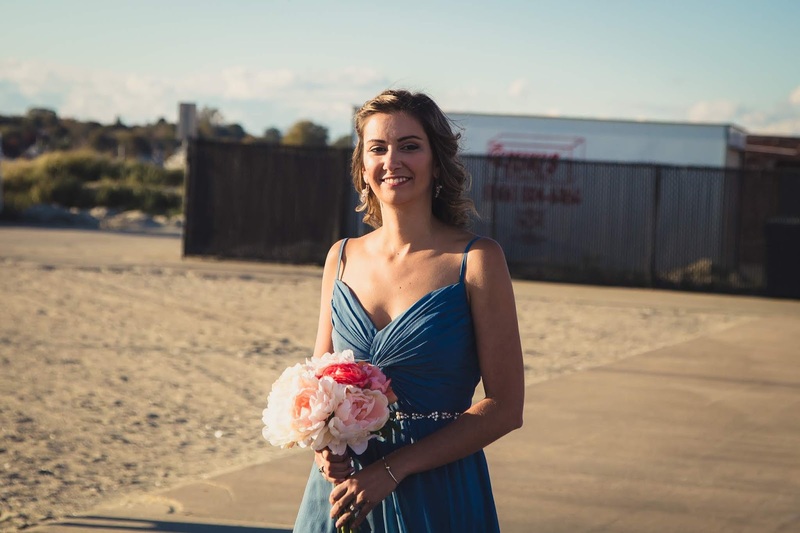 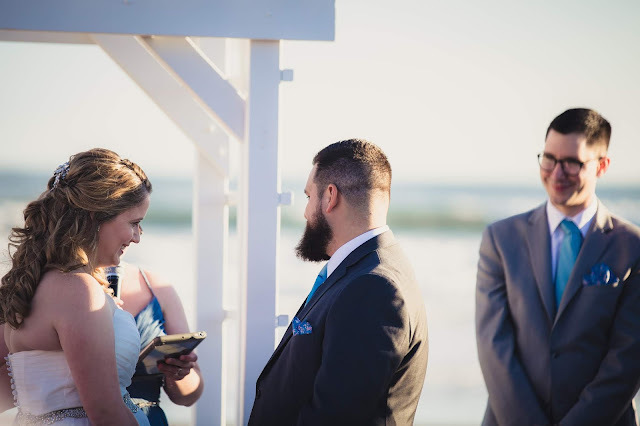 I am not the type of person who like to be the center of attention in front of a crowd so I was relieved that Brittni kept the ceremony short and sweet. 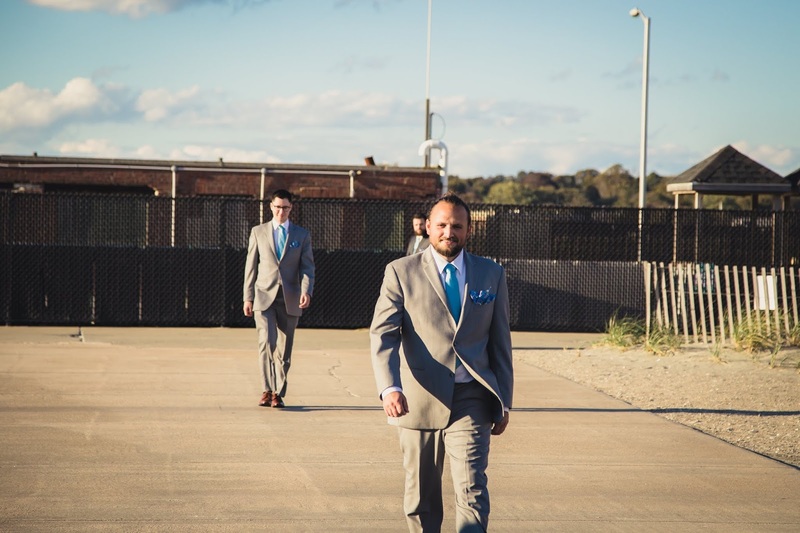 Our ring security members completed their task of handing over the wedding rings. Sorry for the major photo overload but the black and white pictures are some of my favorites as well. 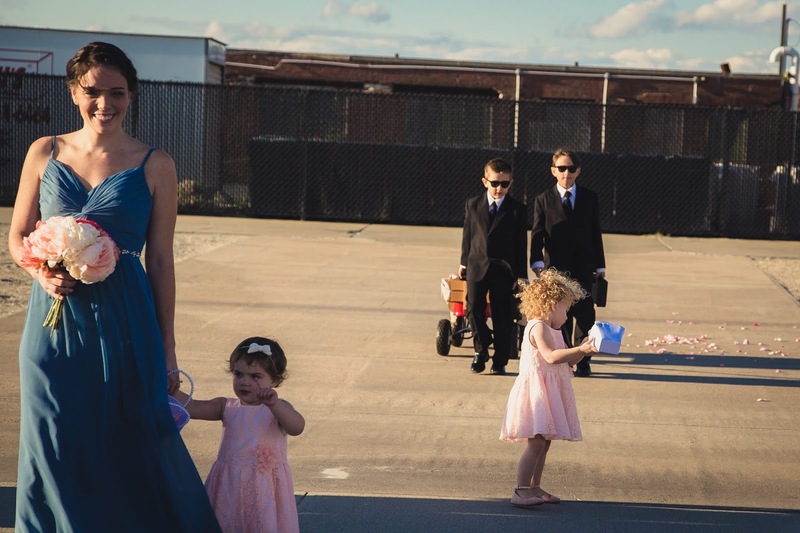 Carissa told us to high five as we left the ceremony and it was a picture I never knew I needed! 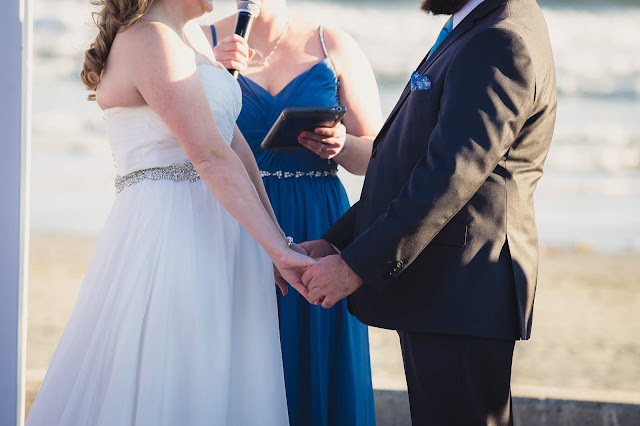 That's exactly how we felt after the ceremony- we did it!! Then it was back down the aisle for everyone else! 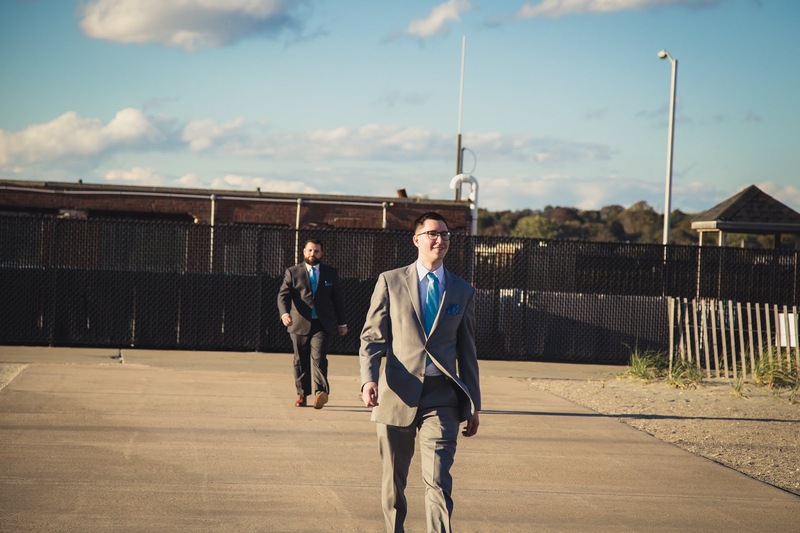 We had some formal pictures to take! 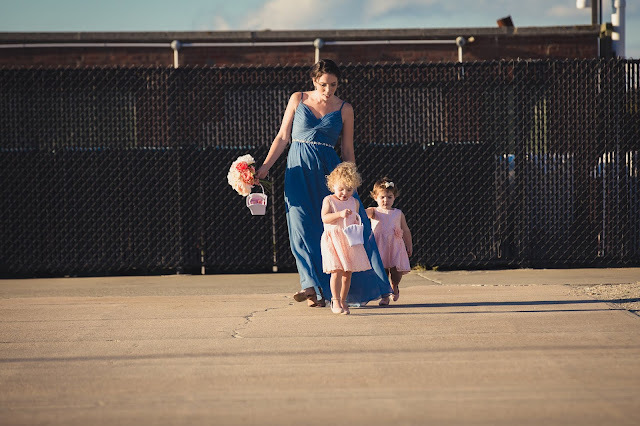 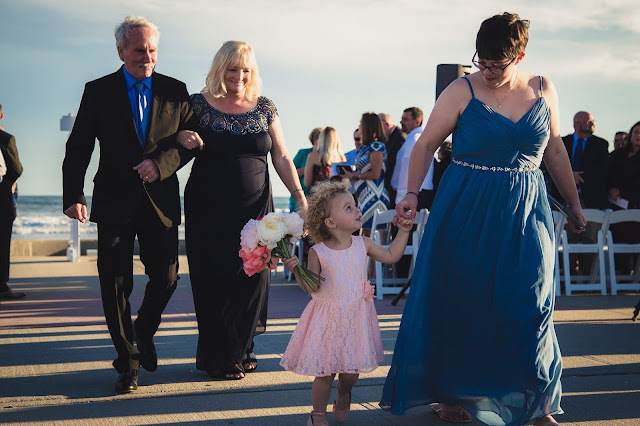 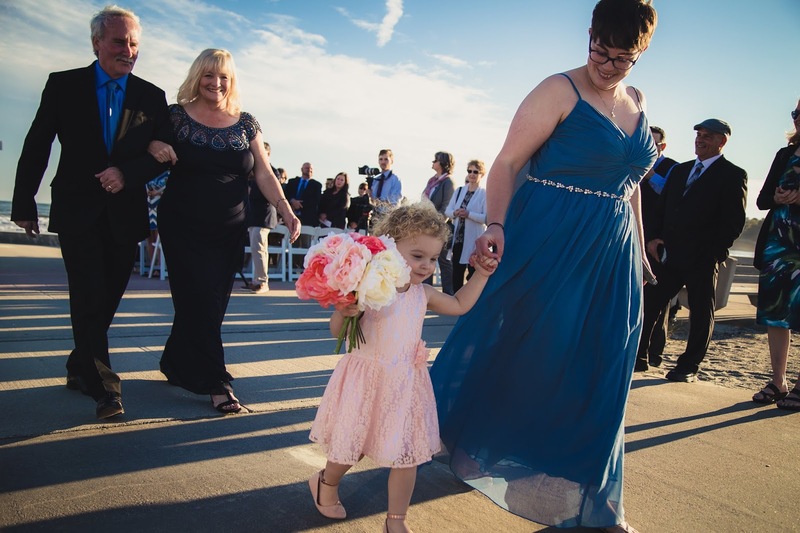 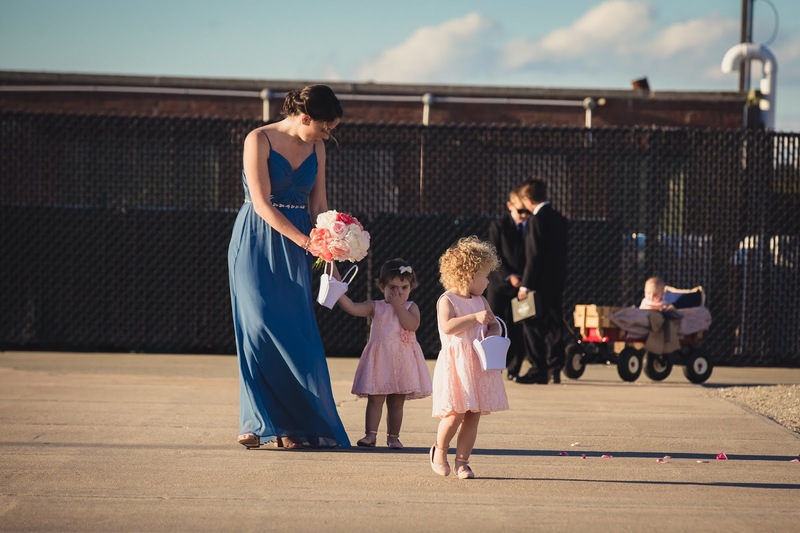 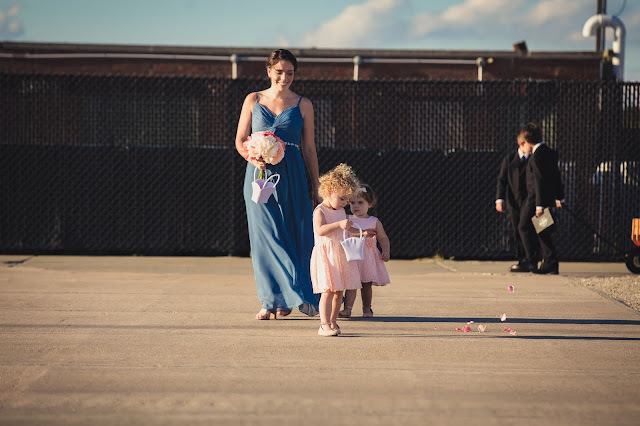 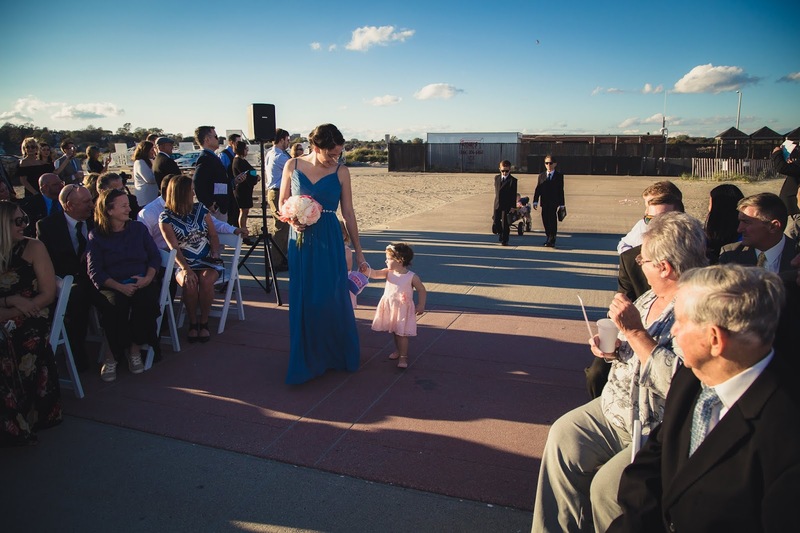 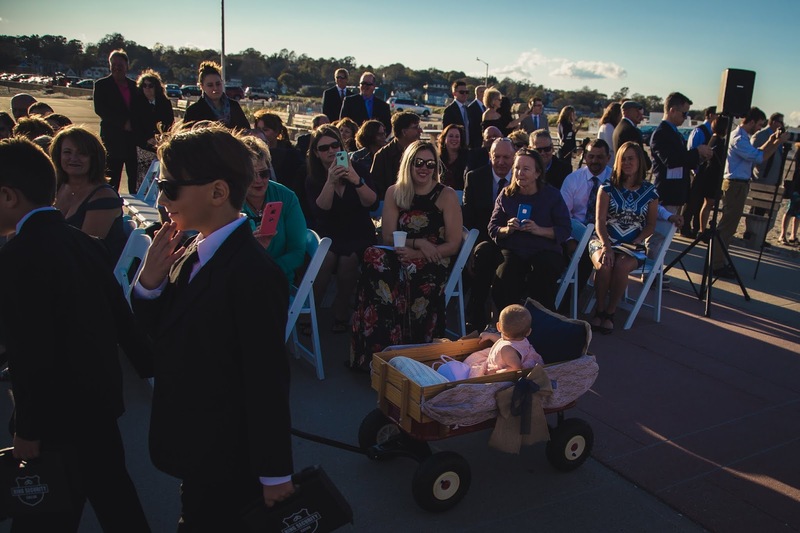 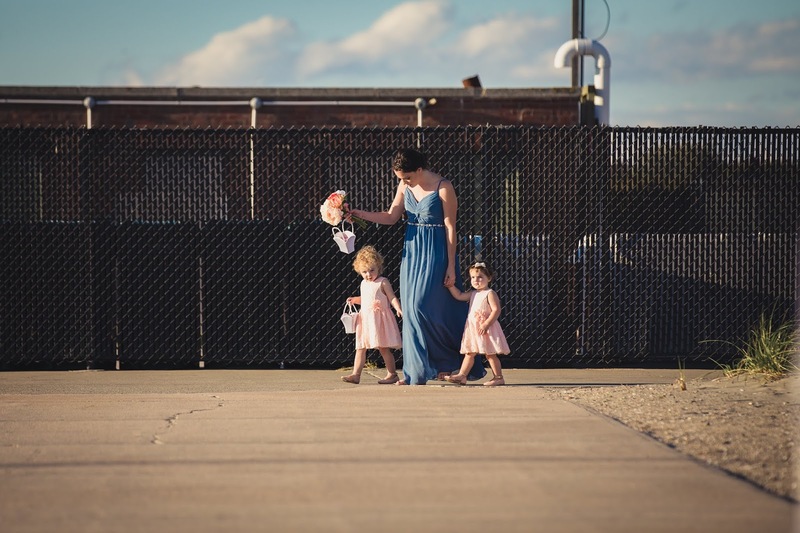 I love this picture with Brittni and Emma and my parents watching them walk. 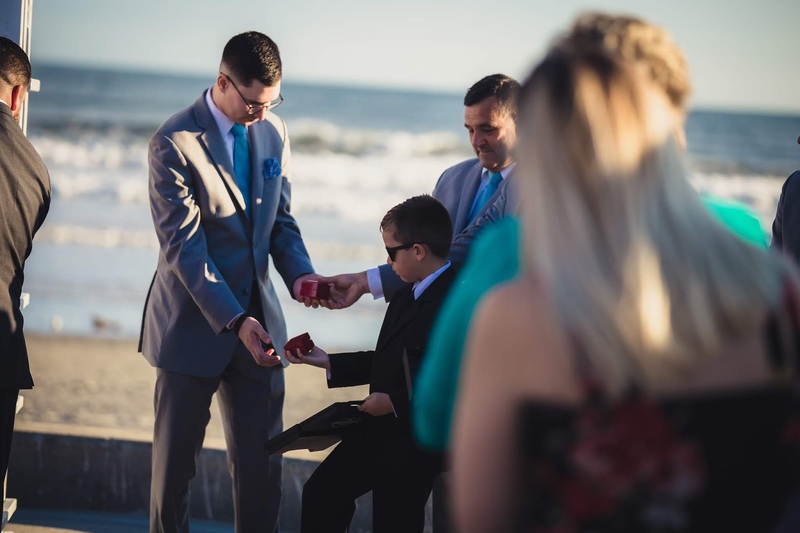 It's just the cutest! We were finally married and now it was time to get some gorgeous pictures while everyone else enjoyed cocktail hour!